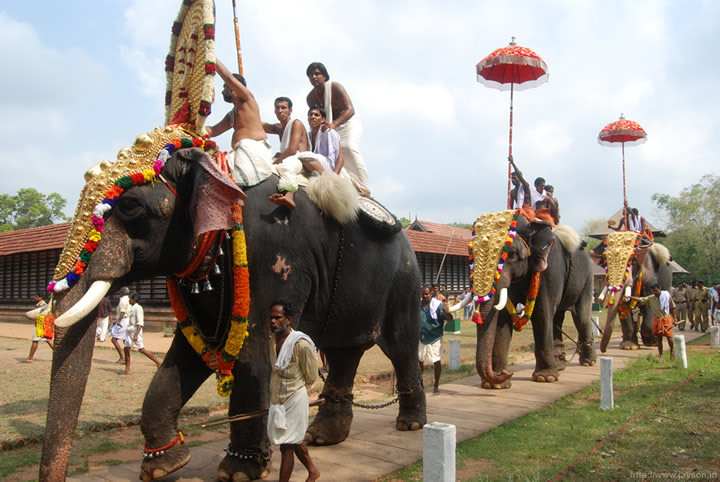 Thrissur Pooram is the most famous temple festival of Kerala. 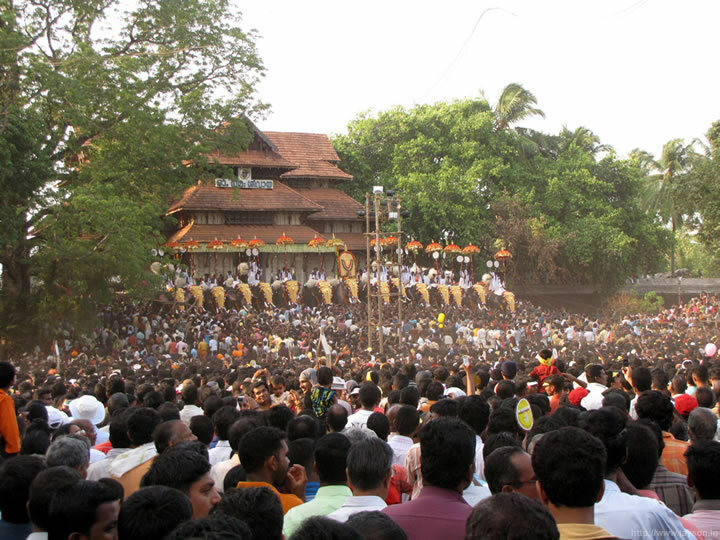 The word "Pooram" means "gathering of people" and once you attend Thrissur Pooram, you will realize the meaning better! 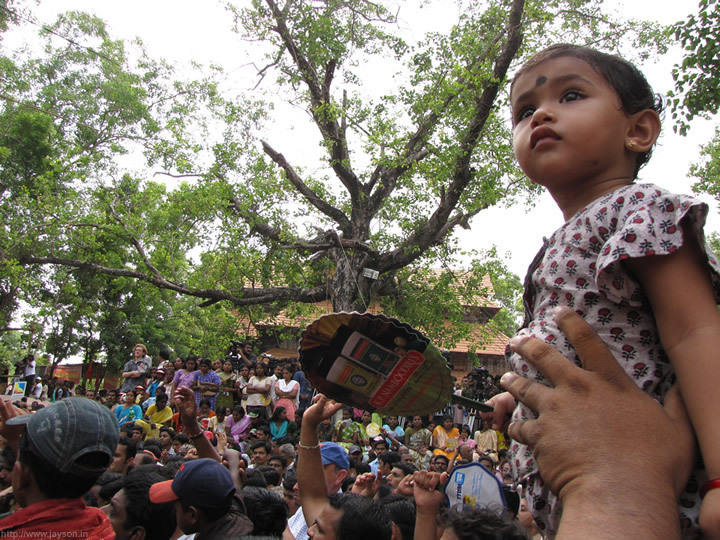 There were so many people and so much positive energy that I was overwhelmed by all of it. 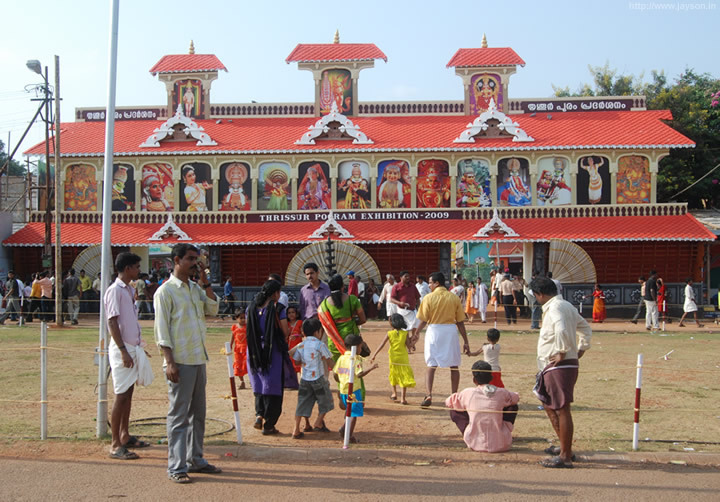 Thrissur Pooram is a Hindu religious festival, but of late it has transcended religious barrier and the temple is open to all during the main Pooram day. 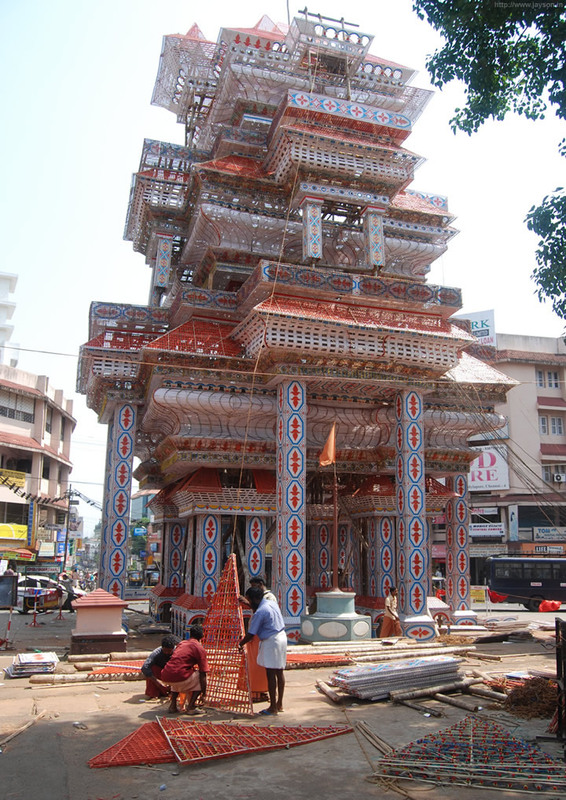 Thrissur Pooram is a festival organized at the Vadakkunnathan temple located at the Thrissur town centre. 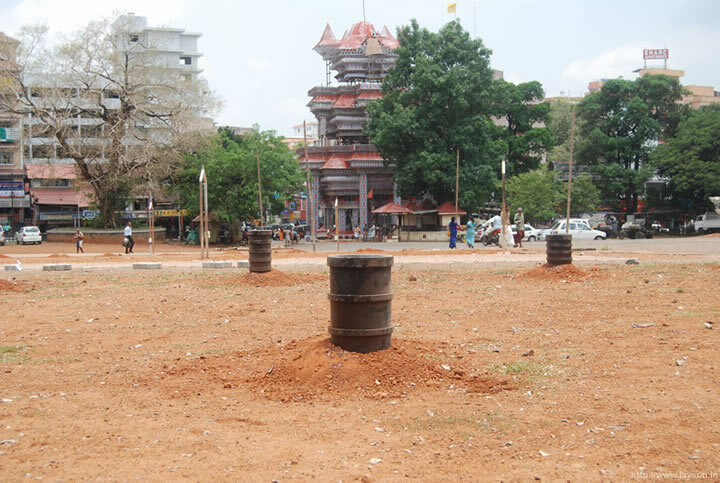 There is a large ground surrounding the Vadakkunnathan temple (Thekkinkadu maithanam) and a wide ring road around it. 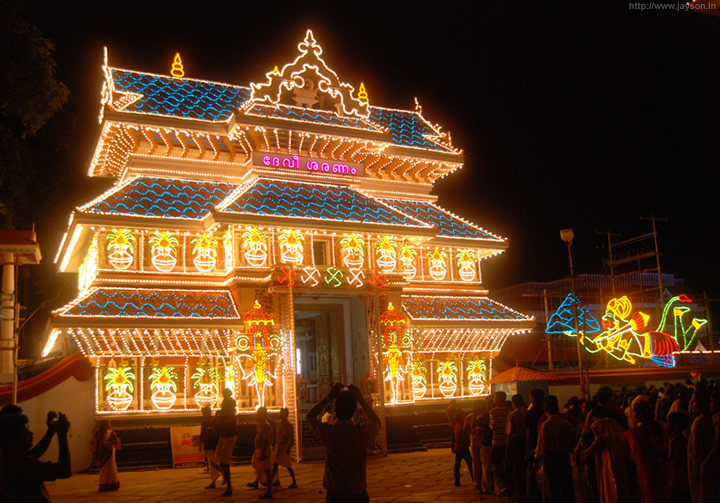 Thrissur Pooram is celebrated as a friendly competition between two groups of temples – Thiruvambady temple group(Kanimangalam, Laloor, Ayyanthole, Nethilakkavu and Thiruvambady temples) and Paramekkavu temple group(Paramekkavu, Karamukku, Chembukavu, Choorakottukavu and Panamukkamppilly temples). 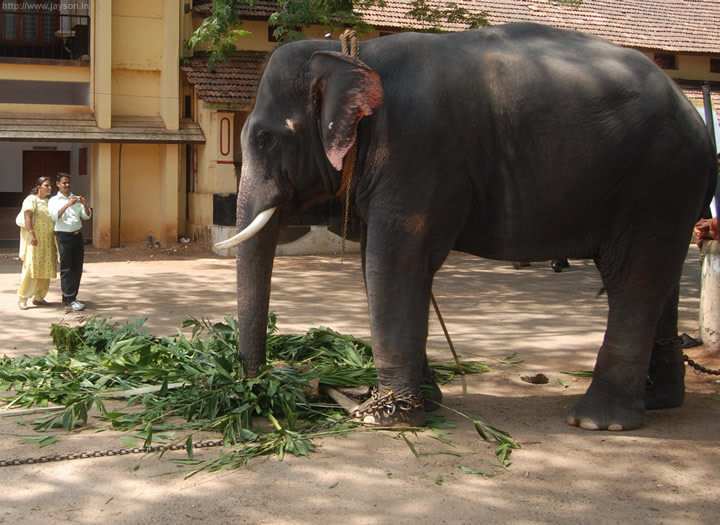 During the festival, Poorams(elephant processions) will start from these temples and will arrive at the Vadakkunnathan temple where Lord Siva is the deity. 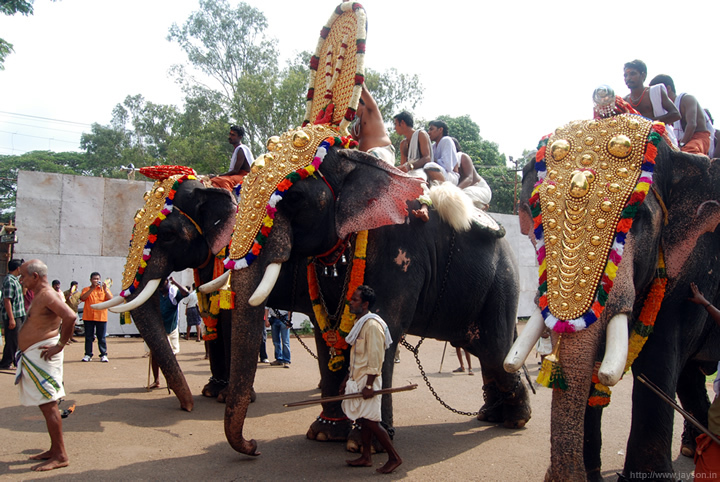 The major attractions of Thrissur Pooram include Elephant processions, Ilanjithara Melam, Panchavadyam and fireworks. 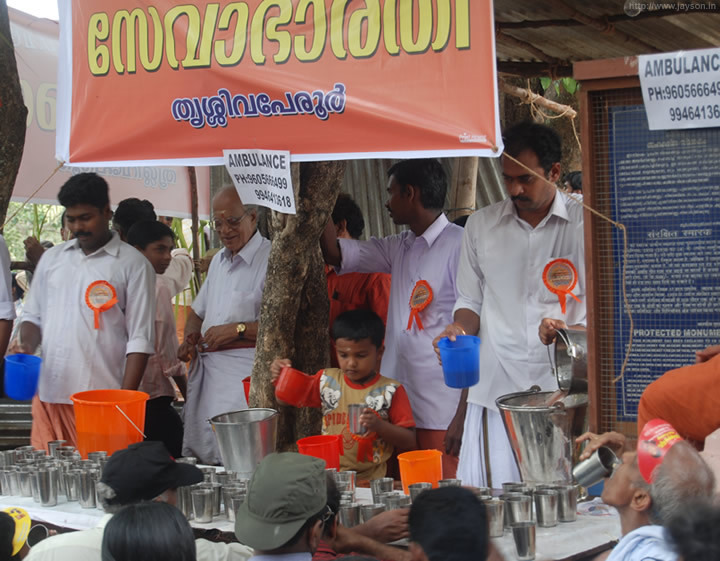 At its core, it is nothing but a gathering of people just for the sake of meeting others! 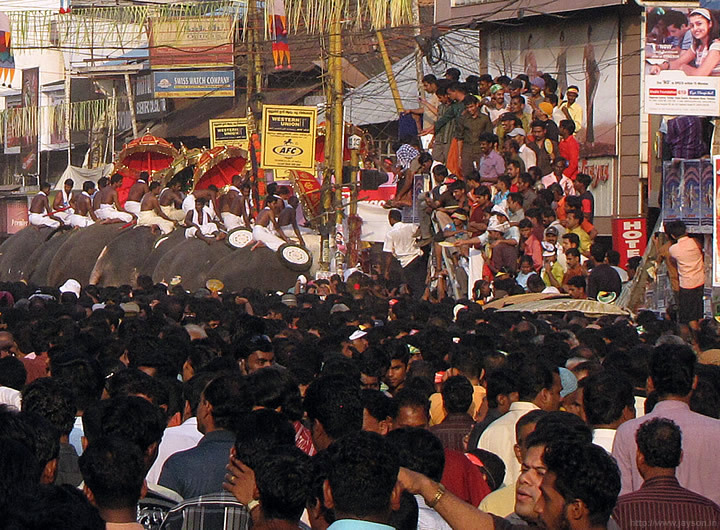 I spent three full days trying to capture the essence of Thrissur Pooram. It was an unforgettable experience and I was physically and emotionally exhausted at the end of it. 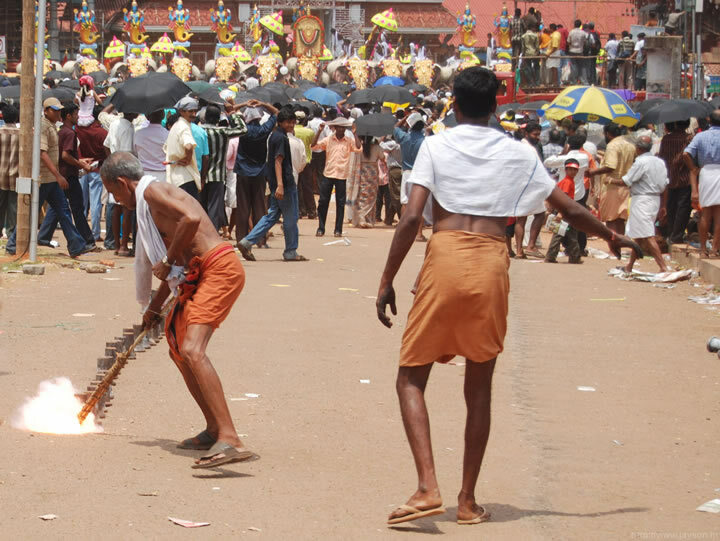 It was probably one of the hottest days in Kerala and the sun was merciless on Pooram days. 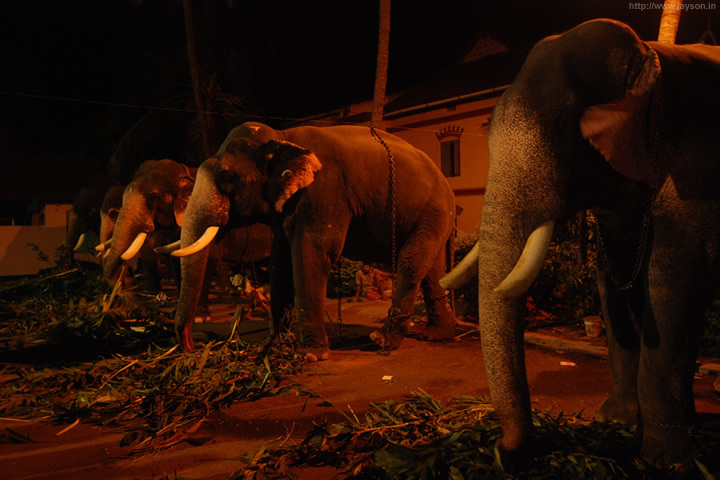 Emotional exhaustion was so intense that I ended up skipping the main fireworks on the last of day of the Pooram. 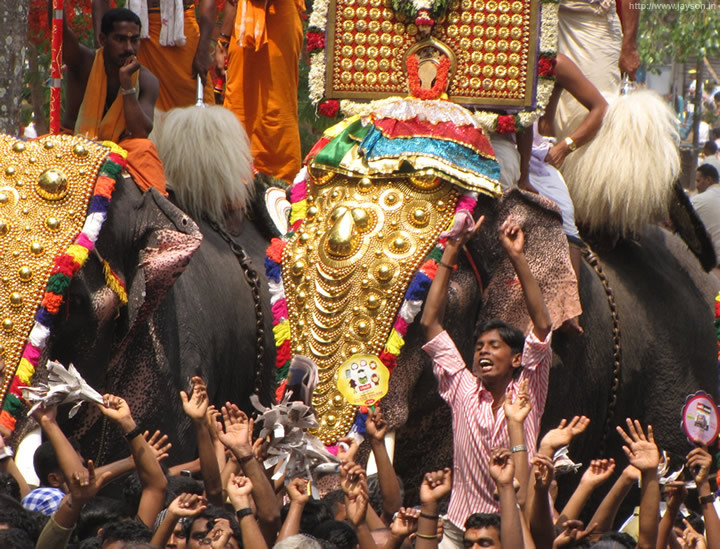 For capturing Thrissur Pooram in a photo essay, I carried two cameras – Nikon D80 with 18-55mm and Canon SX10 with 20x zoom. I ended up with over 1000 photos over 3 days and once again I learnt that less is more. It wasn’t easy picking 99 photos suitable for the photo essay. The photos are arranged chronologically and each has title/time of capture followed by the brief story behind the photo. 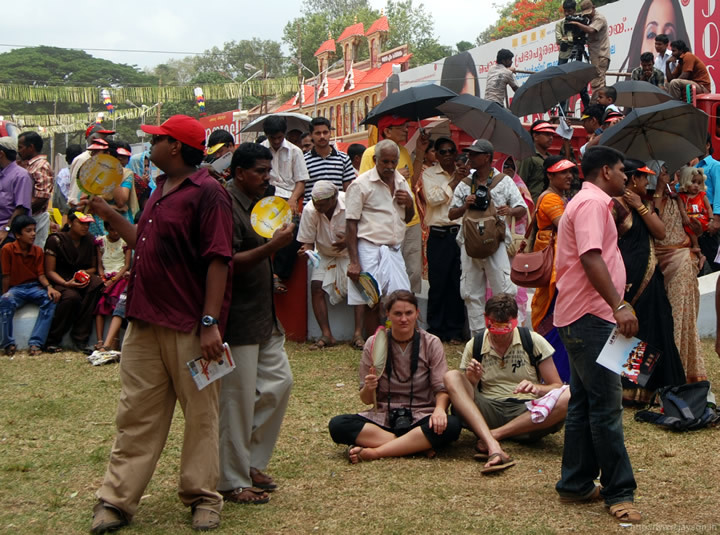 It is the first day of pooram and I started my Pooram coverage from the Pooram Exhibition Ground. 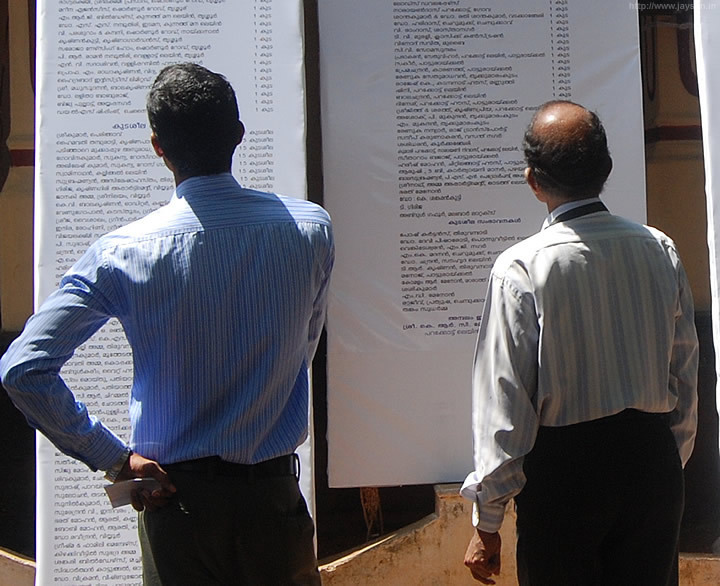 Different government departments and private firms had setup stalls in the exhibition. There was a steady stream of visitors at this place and once you enter you know what the word "suffocation" means. There are so many people walking around that it kicks up a lot of dust in the air. Inside there were a couple of interesting stalls including one from Jubilee Mission Hospital (a collection of human body parts etc.! 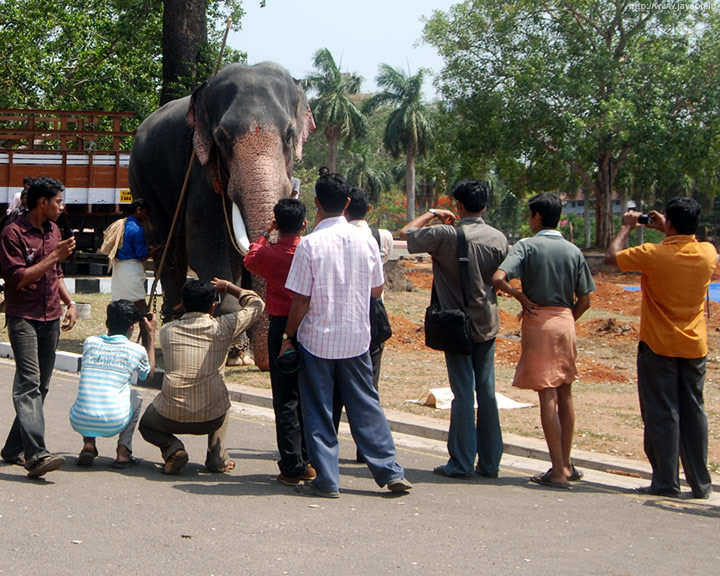 ), elephant photo exhibition by Malayala Manorama and a stall from Indian Railways (see below). 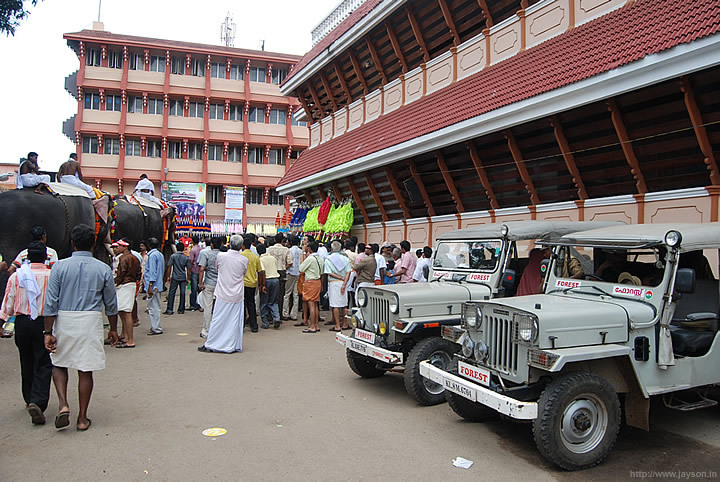 Interestingly there was no stall or booklet about Thrissur Pooram itself! 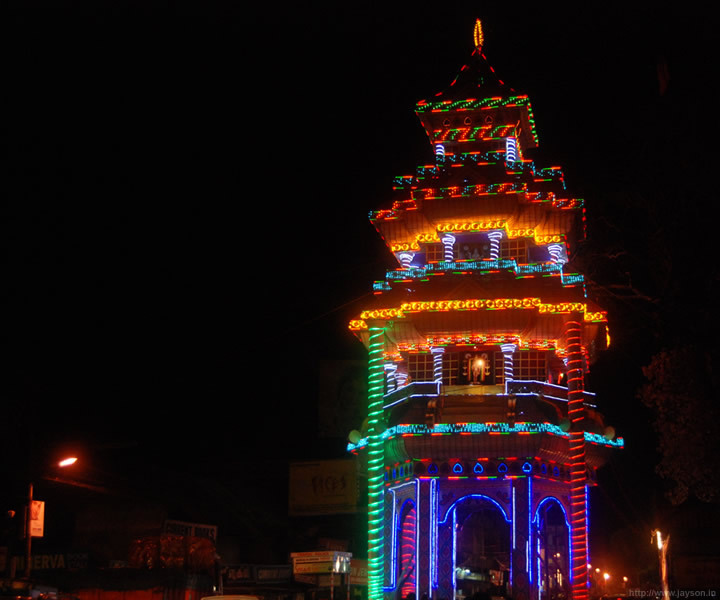 It may seem funny, but I couldn’t find any literature on the Thrissur Pooram anywhere for the next 3 days. 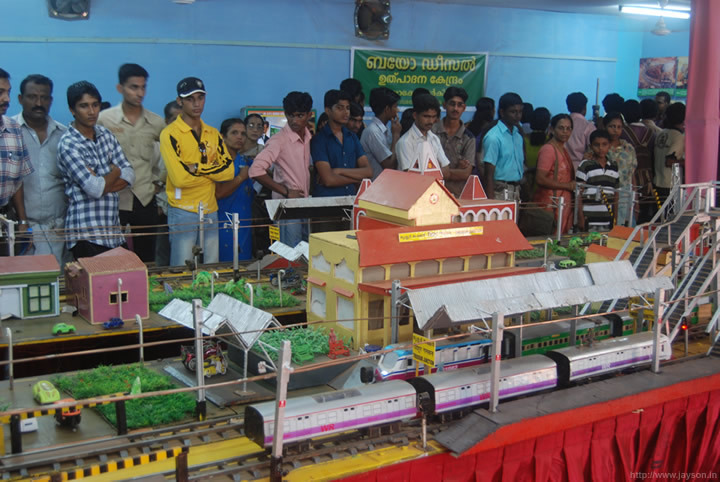 Indian Railways had setup a cool model train table at the exhibition stall. It was a working model and a lot of people found it very amusing. There was a guy from railways who was explaining non stop about railway operations. For a government department, he is a very dedicated employee! 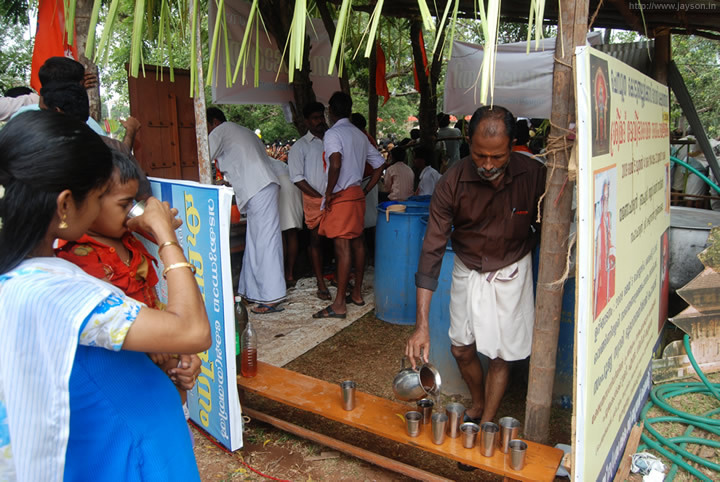 By the end of the first day, people started pouring in at the ground between Vadakkunnathan temple and Paramekkavu temple(seen at the other end). In less than 2 hours this place will be filled by people eager to watch sample firework display. 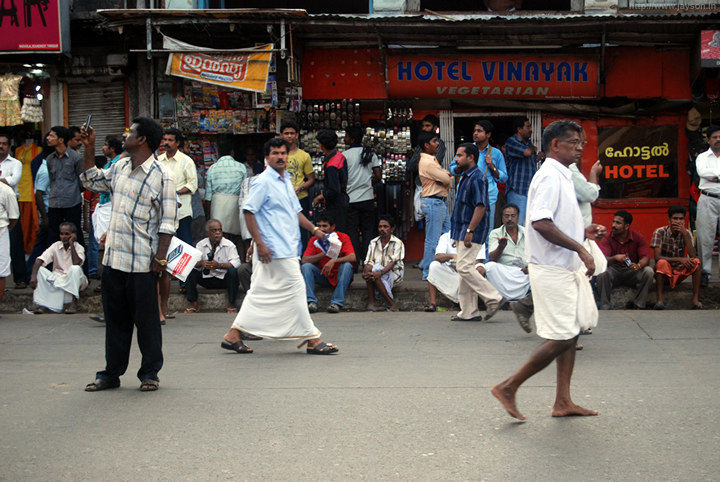 The road surrounding the "Thekkinkadu maithanam" is usually jam packed with vehicles. 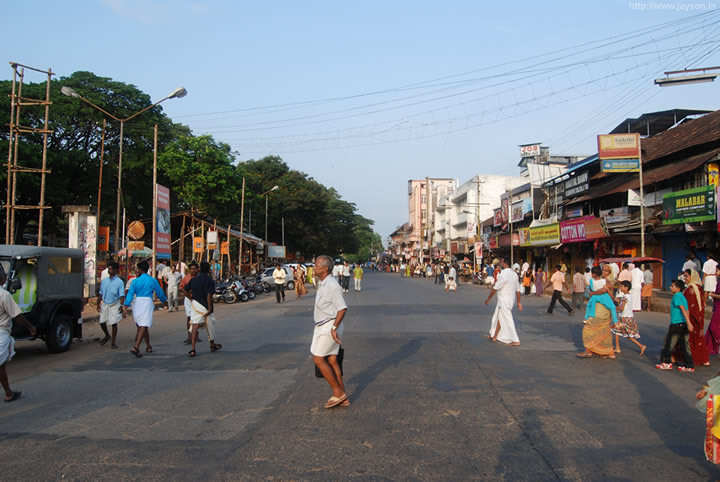 But on the first day and last day of Pooram, traffic is banned on this stretch. People have started assembling here to watch sample firework display. 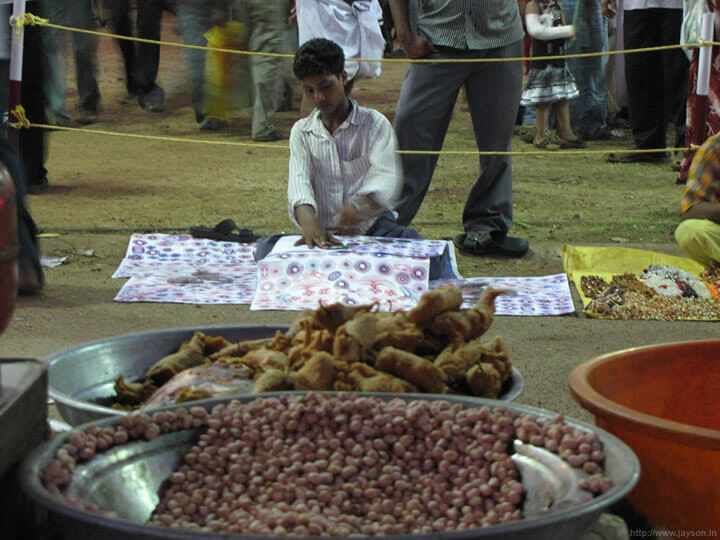 Street sellers make a lot of money during pooram. 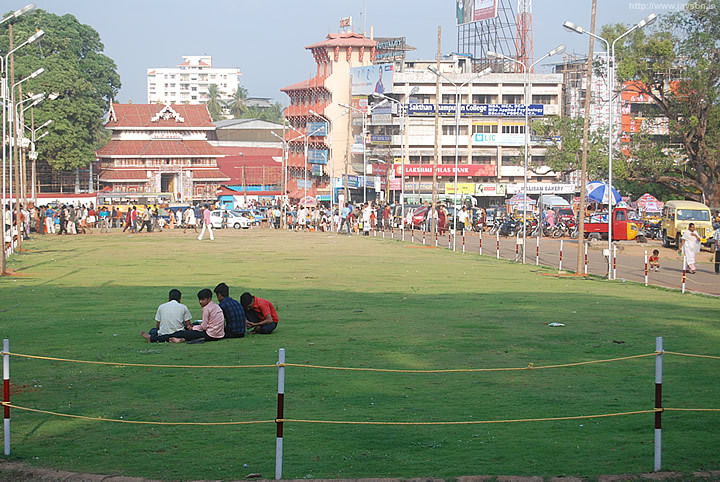 The ground surrounding the Vadakkunnathan temple is where all the action takes place. 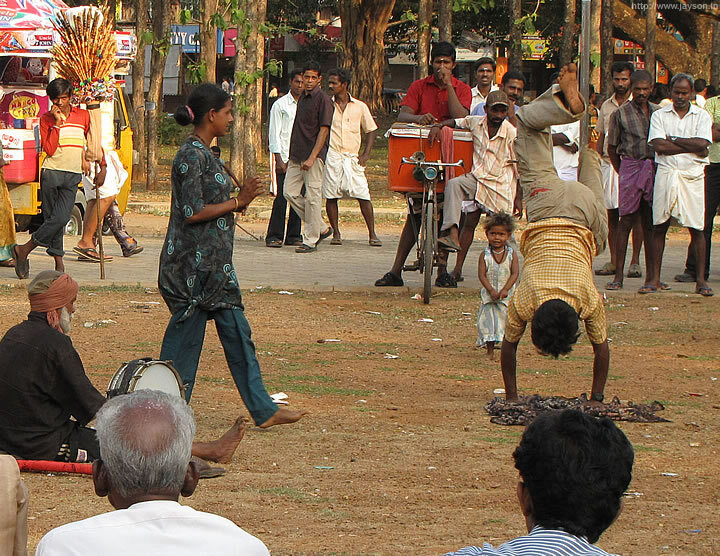 These street performers provide the much needed entertainment to the people waiting for the sample firework display. 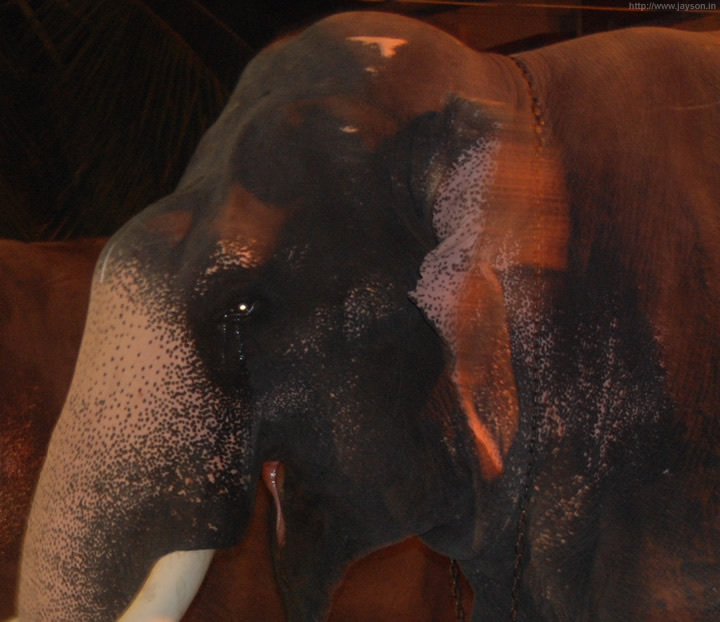 This was a big family from Tamilnadu and everyone including a 3 year old child participated in the circus. 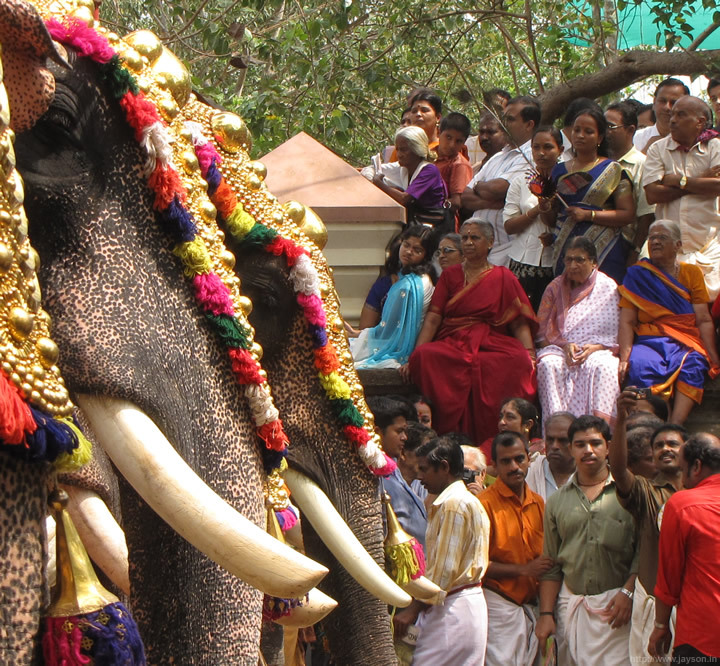 Thrissur Pooram is where you can find all sorts of things being sold. 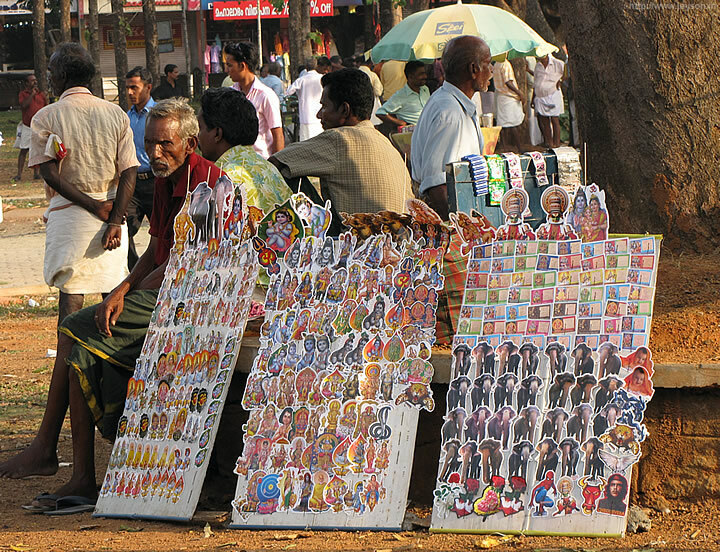 Pooram attracts a lot of elephant enthusiasts and these paper elephant stickers are sure to catch their attention. 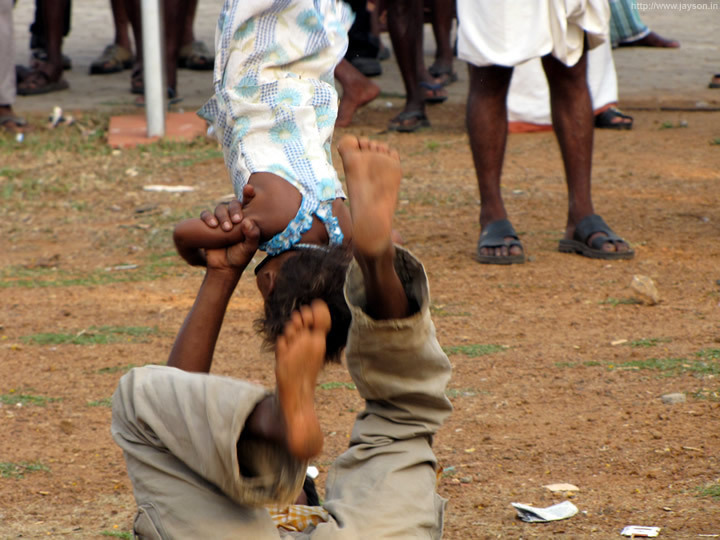 It is not easy to watch this child perform without being terribly sad (especially when you have a child of that age). 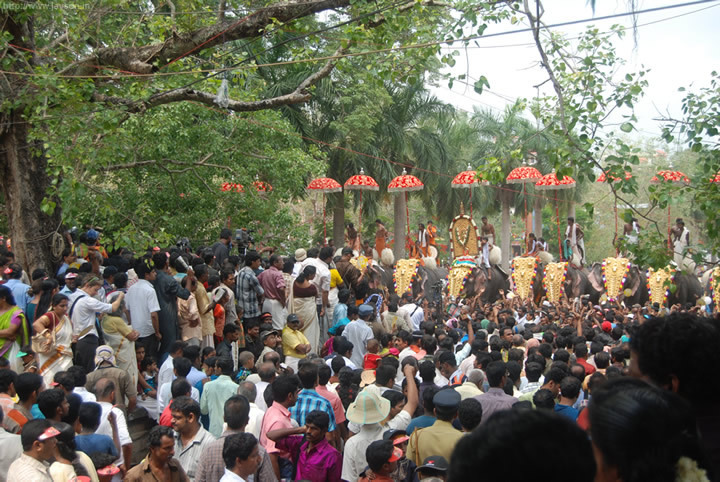 For me, Pooram was an emotional roller coaster. 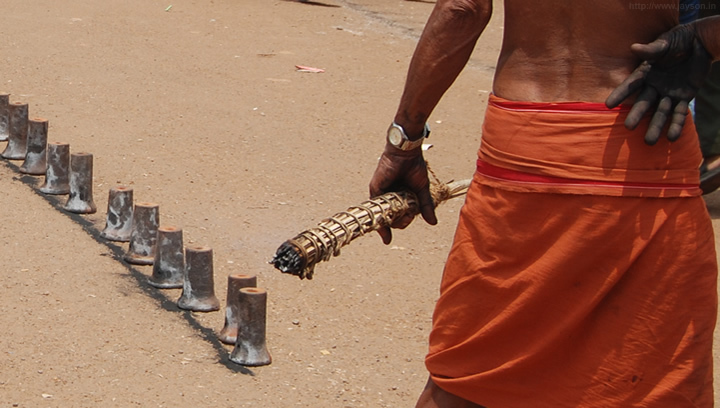 The sample fireworks are being installed in the holes dug on the ground. 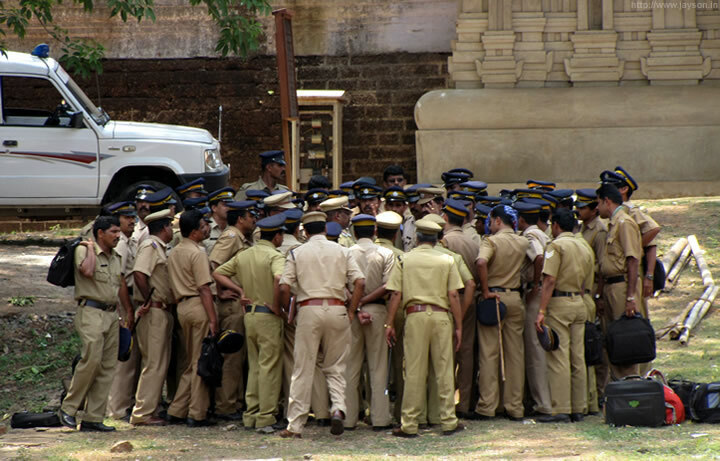 Needless to say, this is a dangerous job and police ensures that no one can enter the area after 6pm. People start to sit along the Swaraj round road occupying best spots to watch sample fireworks. There is a lot of excitement and energy in the air. 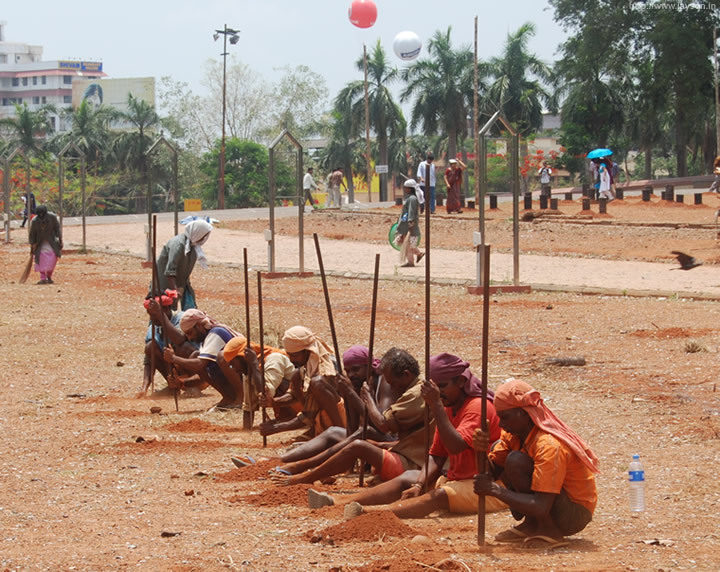 Barely 200metres away from the firework installation, this Tamil family is entertaining a large group of people. 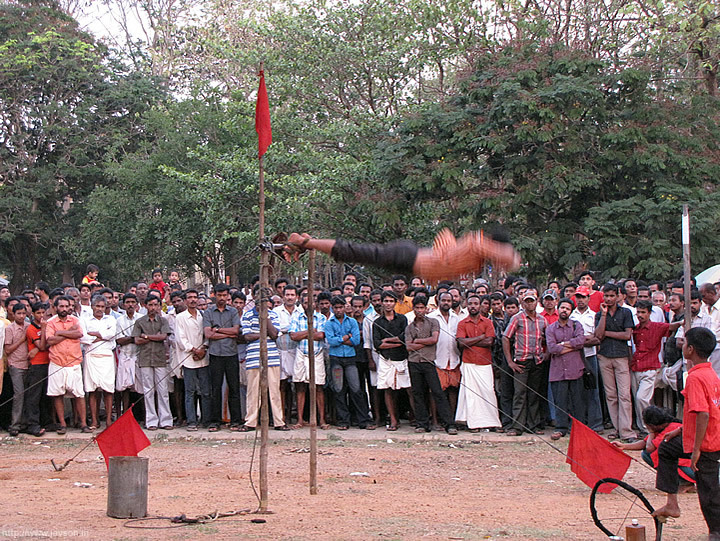 A rope is tied to his feet and he is doing a "clock" demonstration. 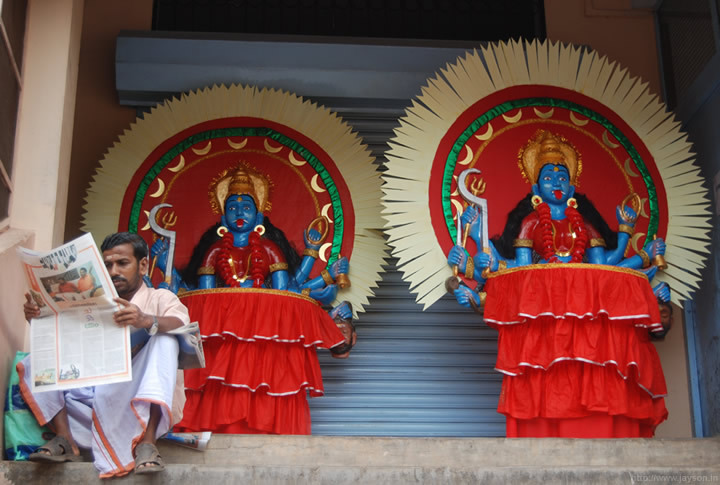 His wife on the right side cries saying that her husband is at terrible risk and can die any minute. Emotional blackmailing is a good tool for getting money. 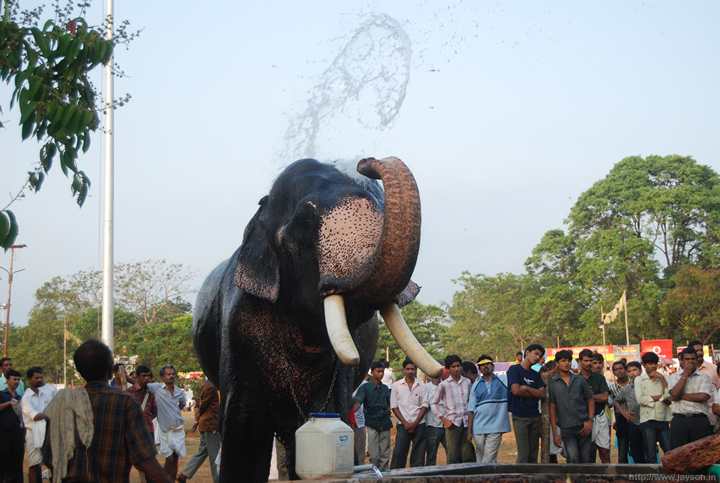 Surprisingly even during the main Pooram activities, a large crowd could be seen watching the circus! I noticed him while standing in a queue to buy some snacks. He was drawing non stop on large sheets of paper using plastic pencil guides. It seems to be the best way to attract customers. 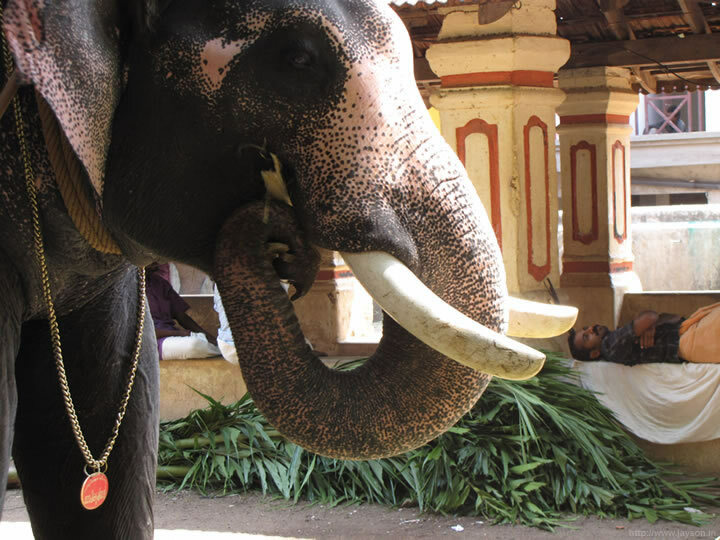 He was sitting on the side of the road which leads from Vadakkunnathan temple to Paramekkavu temple. 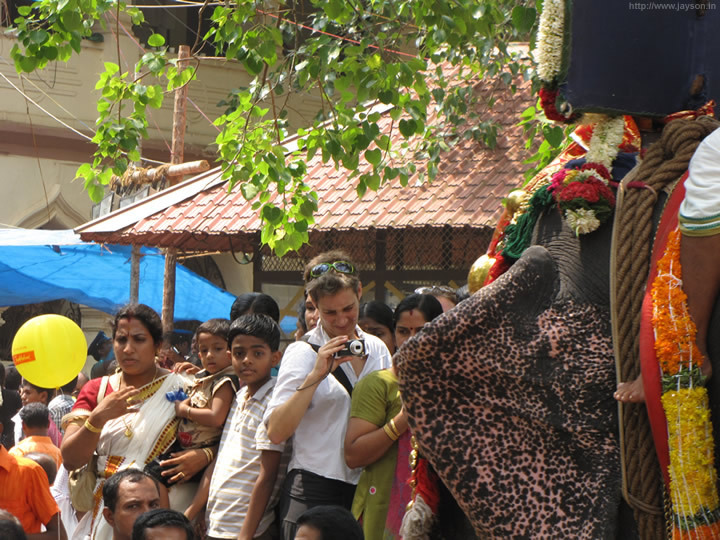 Right behind him you can see crowds jostling to get inside the Pooram exhibition. 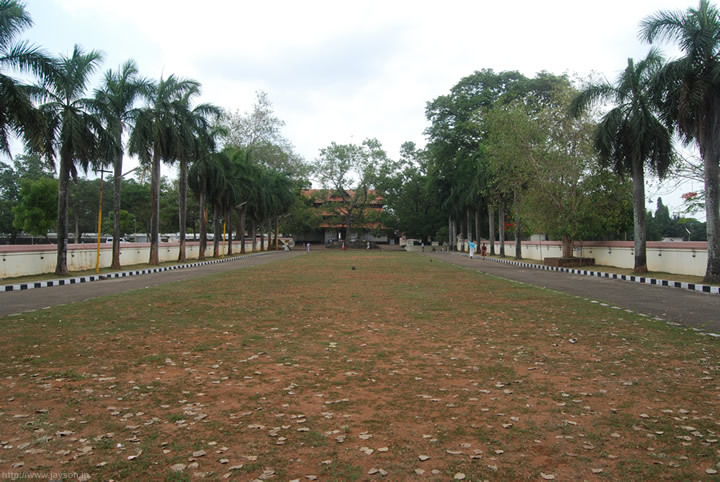 In less than 48 hours, this place will be so crowded with people that if it rains water drops will never hit the earth! The sample fireworks was scheduled at 7:30pm and I worked my way through the crowds to reach as near as possible to the Paramekkavu firework display. It was a bad decision. It was so crowded that it was scary. 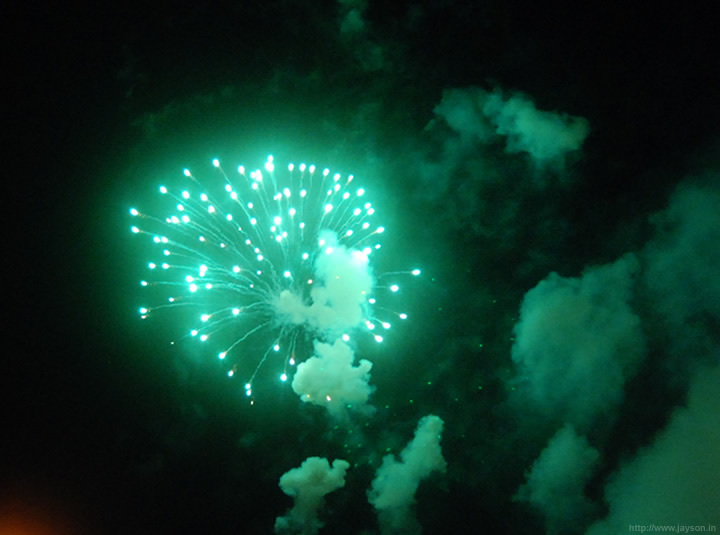 It was also not easy photographing fireworks when you are pushed by thousands of young males from all sides. Being right near the fireworks is an exciting and nail biting experience. 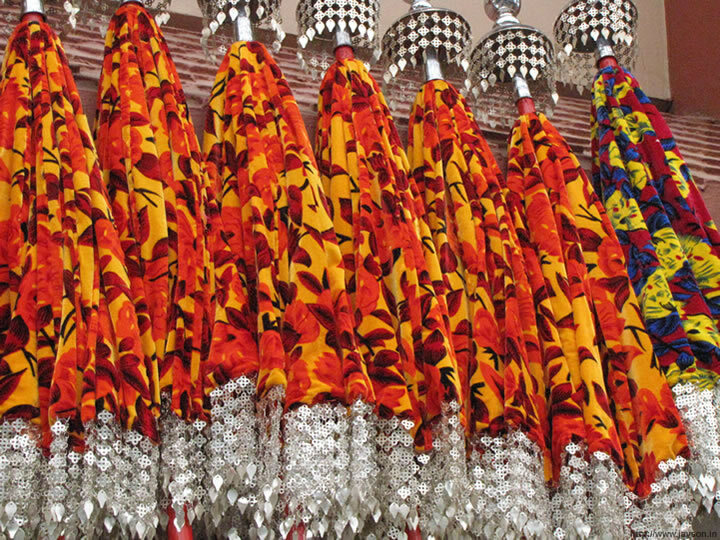 The sound, the echo and the smell creates a sensory explosion. 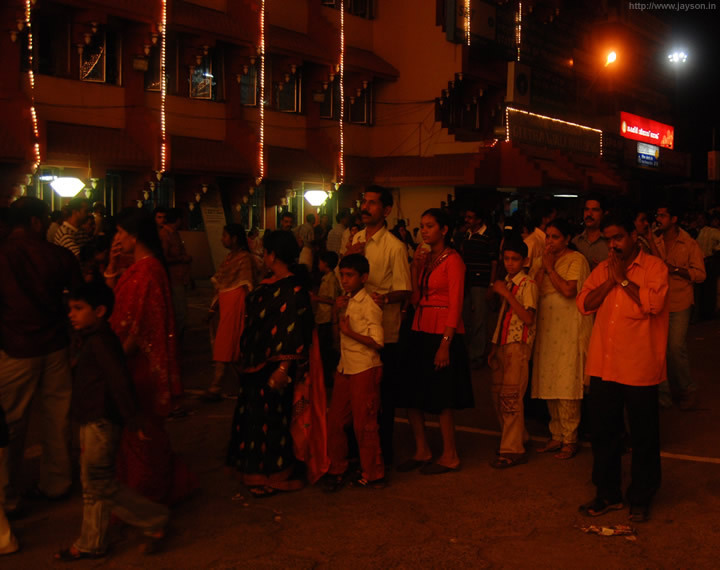 People were pouring in large numbers even during the firework display. 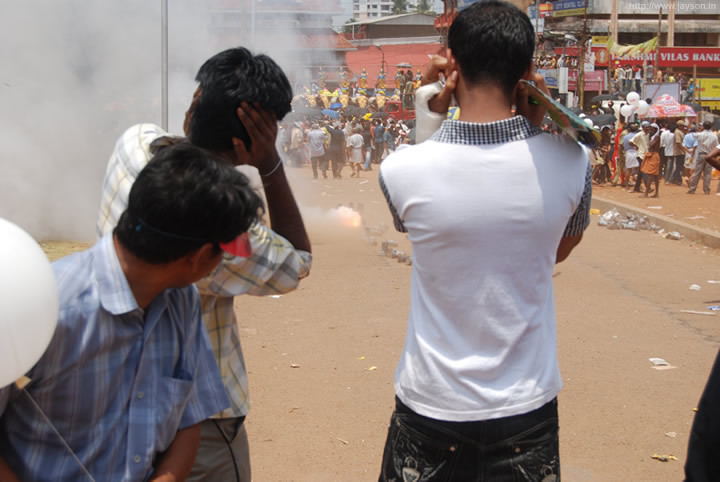 Once the main fireworks was over, crowds immediately started leaving the Swaraj round. The fireworks continued for another half an hour. 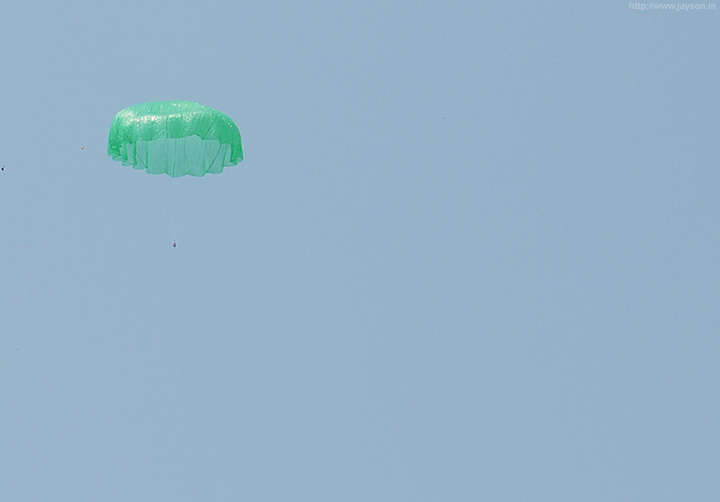 I left the ground at around 8PM. 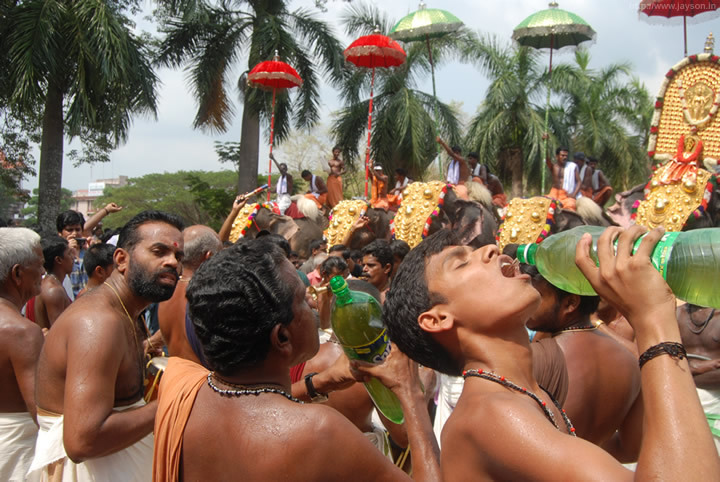 I had two more days of Pooram to cover. 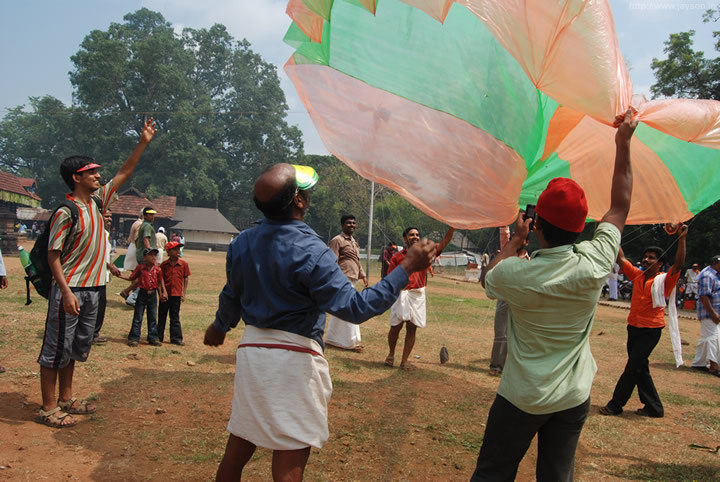 There aren’t many events on the second day of the pooram. 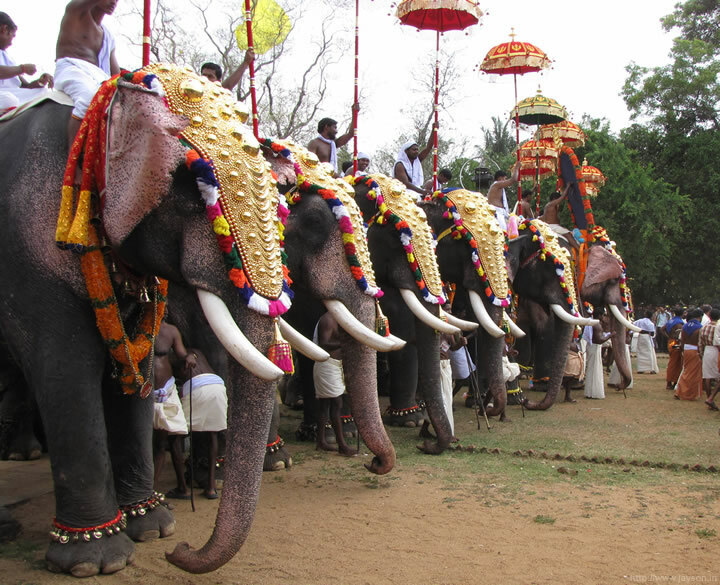 People spend time watching elephants or visiting "chamayam" exhibitions where all ornaments used for the main pooram is displayed. 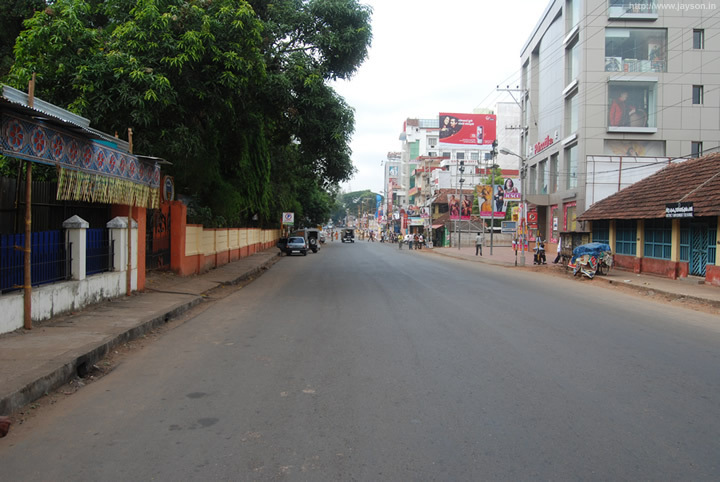 The areas around Vadakkunnathan was almost deserted. 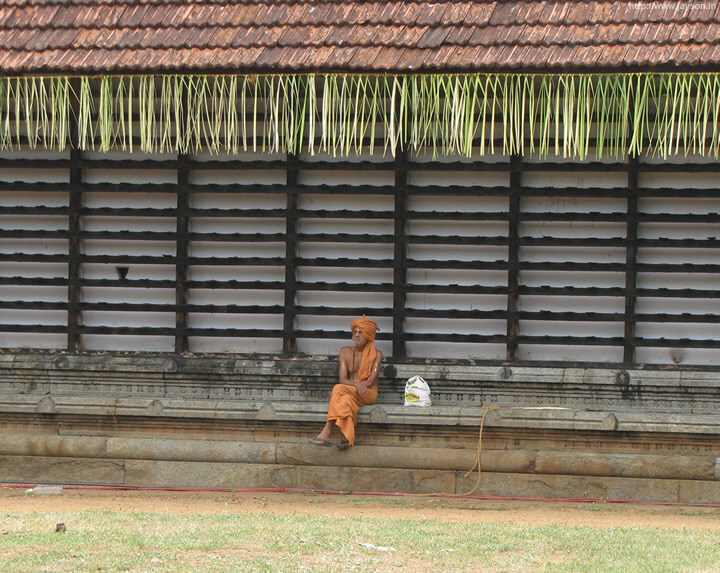 I wanted to enter the Vadakkunnathan temple to take a few photographs. I asked the security and they guided me to one of the trustees of the temple. 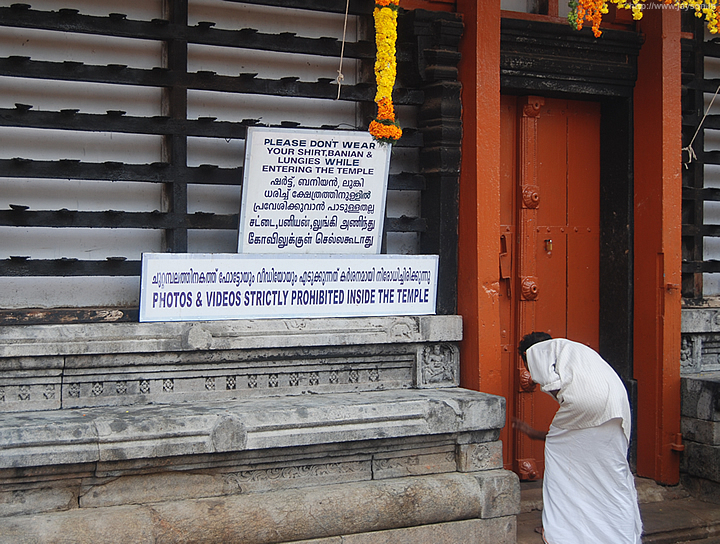 When I told him that I need permission for taking photos inside, he replied that they only give permission to television crews. 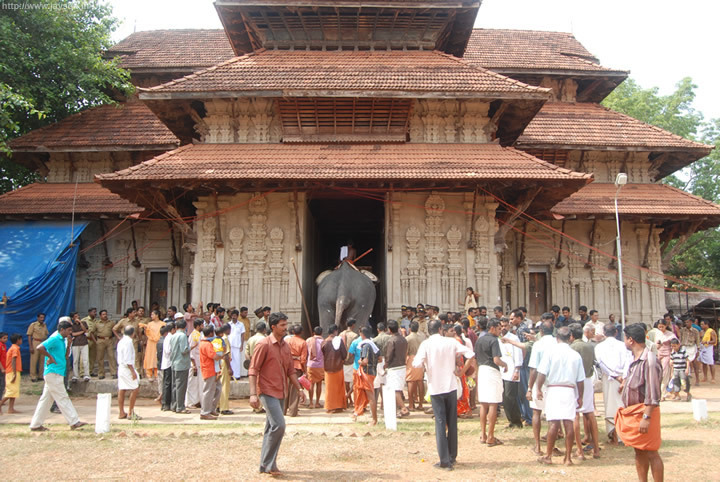 What I didn’t knew was that during the main pooram anyone could enter the temple. These huge containers are used for large fireworks. 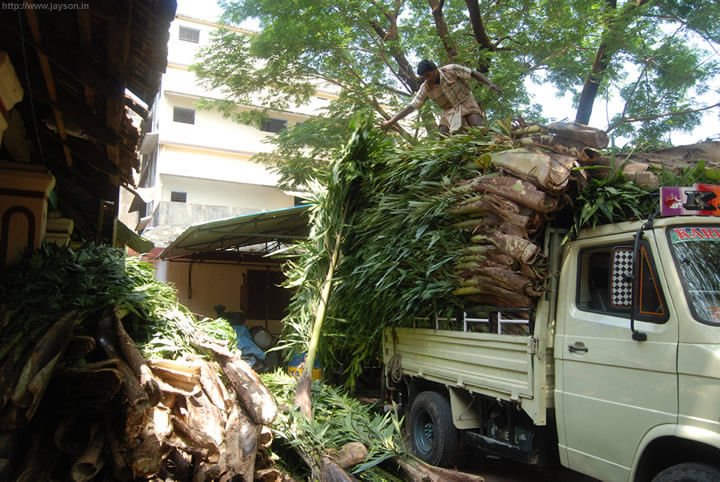 They are safely secured on the ground as even a small tilting of the container can cause destruction and death. In the past, there had been accidents which caused death and injury. 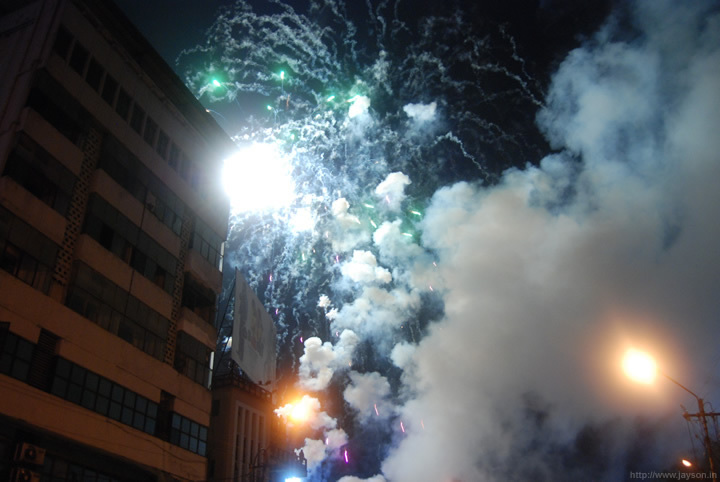 Fireworks are stored in temporary structures and obviously it is a dangerous area to be. There was round the clock security at this site. It was 1pm and terribly hot. Even with the hat on I felt as if my head is melting. 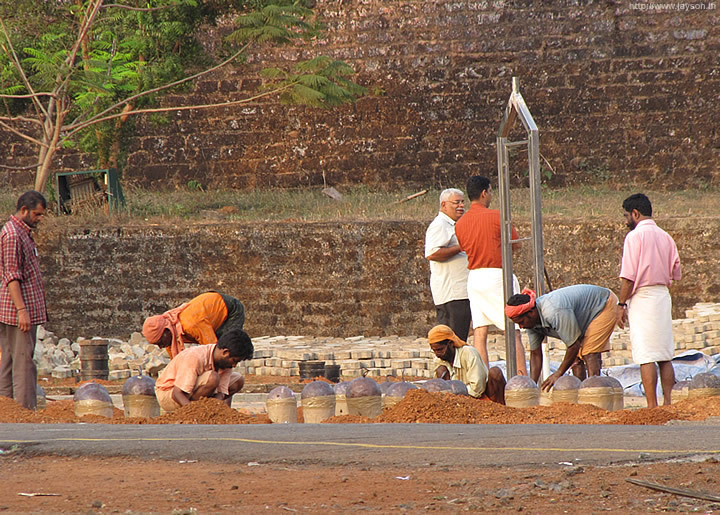 Then I noticed these workers preparing holes for the main fireworks. 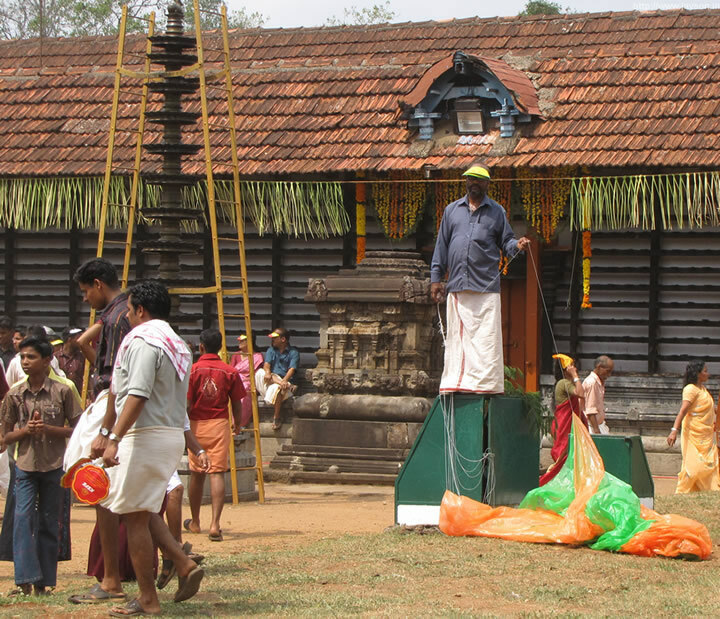 A lot of stuff at Pooram is still done using the traditional techniques. 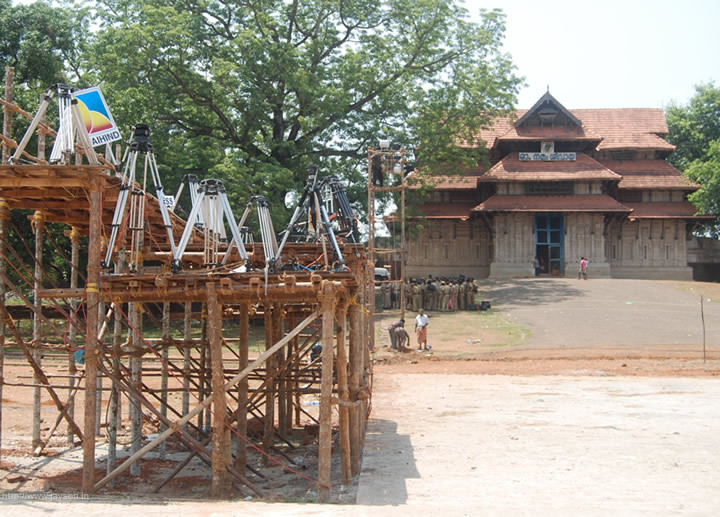 Almost all regional TV channels had live coverage of Thrissur Pooram. 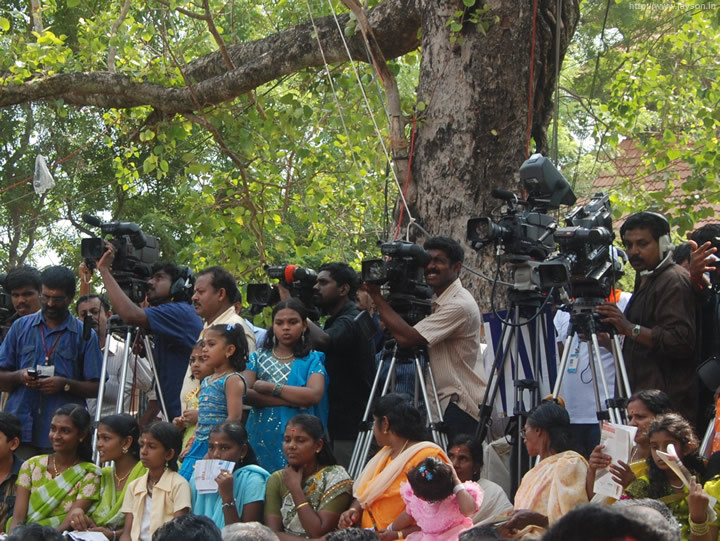 In fact it has reached such a stage that all the prime spots are occupied by journalists. 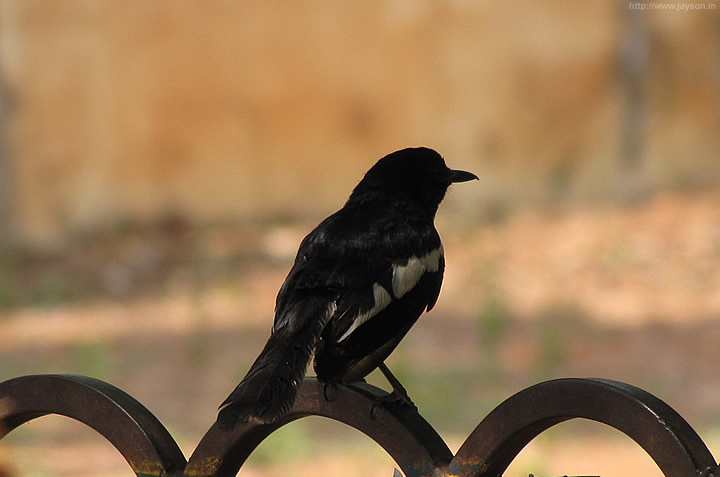 Ironically some of them were not happy that I was covering them. 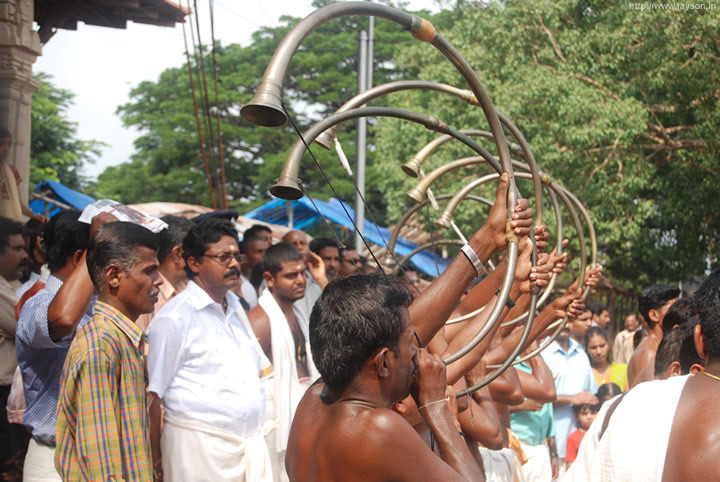 Thrissur pooram is probably the only event in Kerala where you could spot so many different types of tripods. 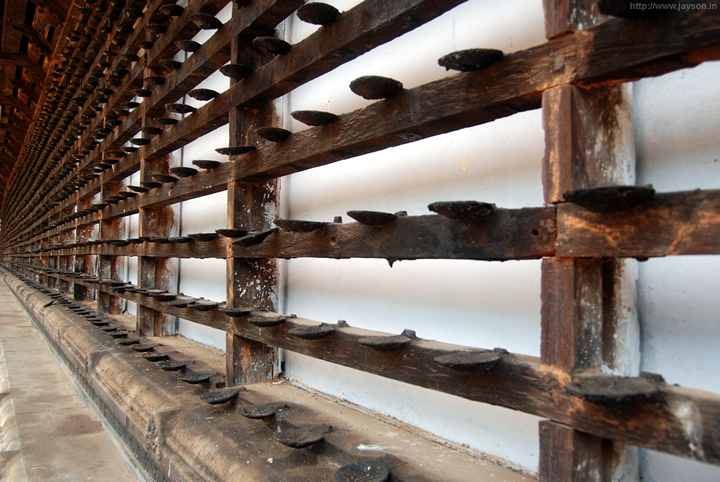 These stayed here for 3 days and many of them were chained to the platform to avoid theft. 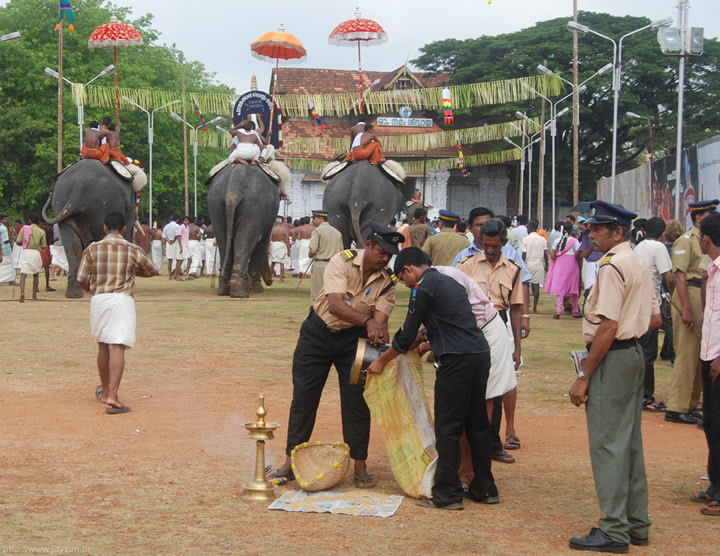 For Kerala Police, Thrissur pooram is a policing nightmare. There is a lot of planning that goes into the security and police officers from across the state participate in this mammoth task. 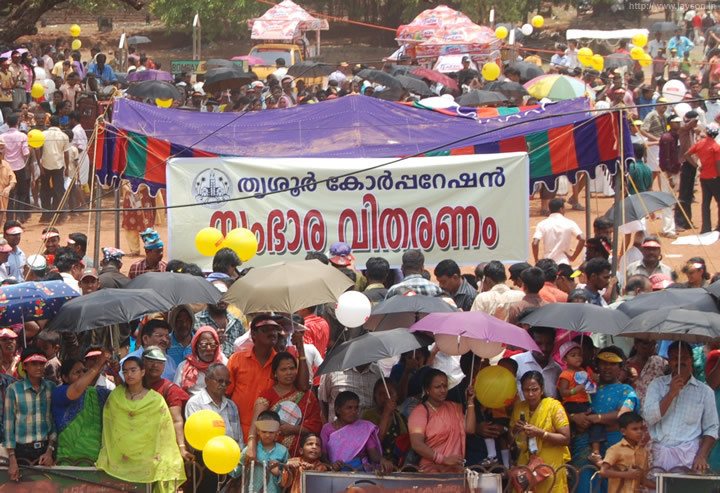 This is just one of the meetings organized at the Pooram ground. 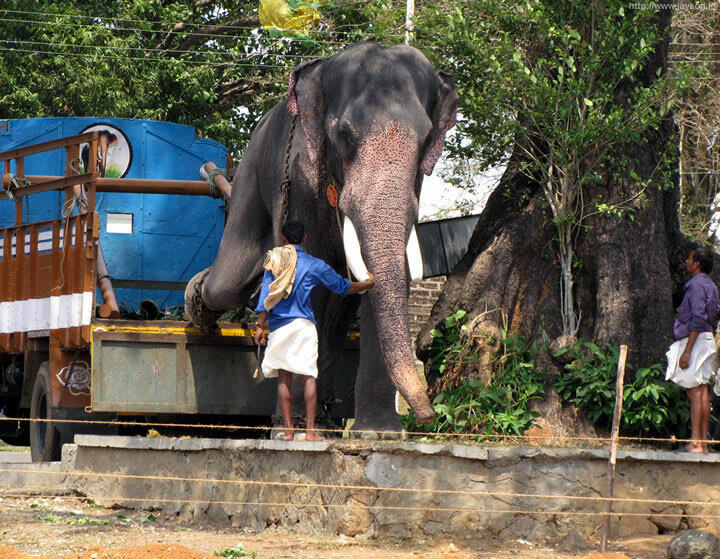 With over 50 elephants at the pooram site, keeping them well fed is not an easy task. 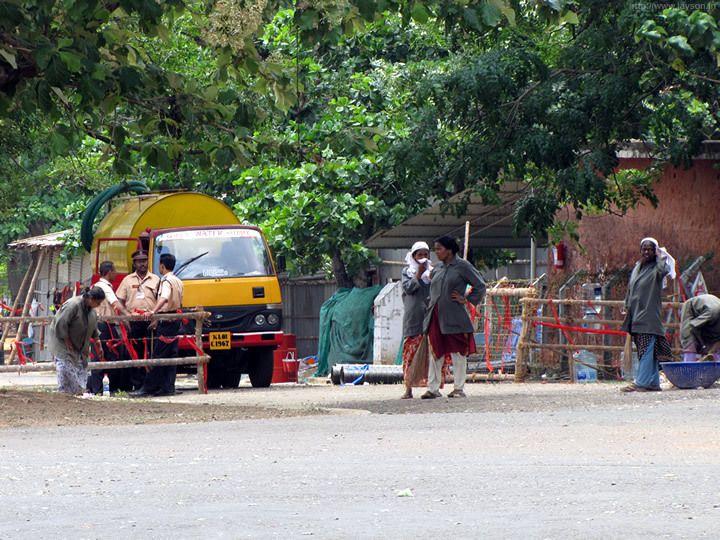 You can find steady stream of lorries arriving here. 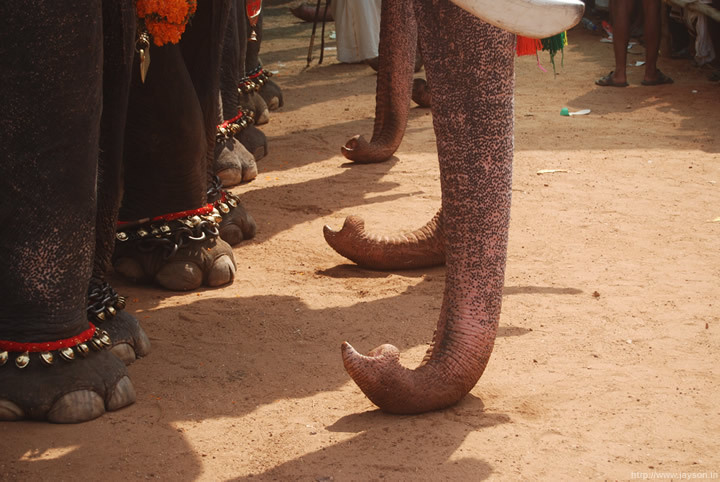 Elephants are the biggest attraction everywhere and everyone tries to get photographs from all angles. 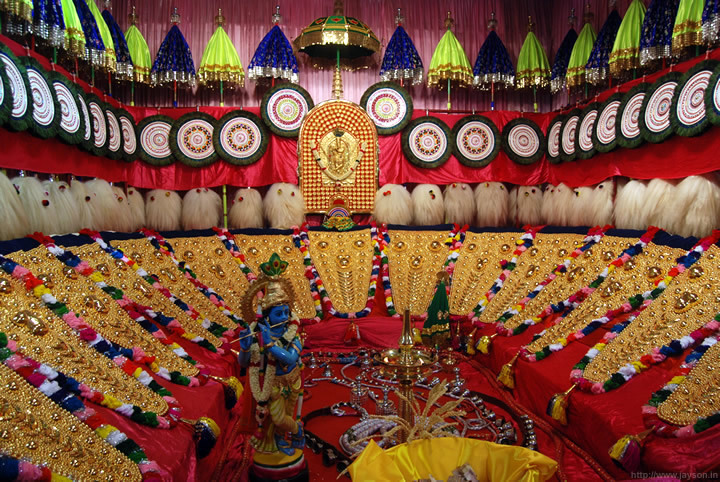 Thiruvambady and Paramekkavu groups display all the ornaments in their respective head quarters. Both these are on the ring road and you can walk from one place to the other. 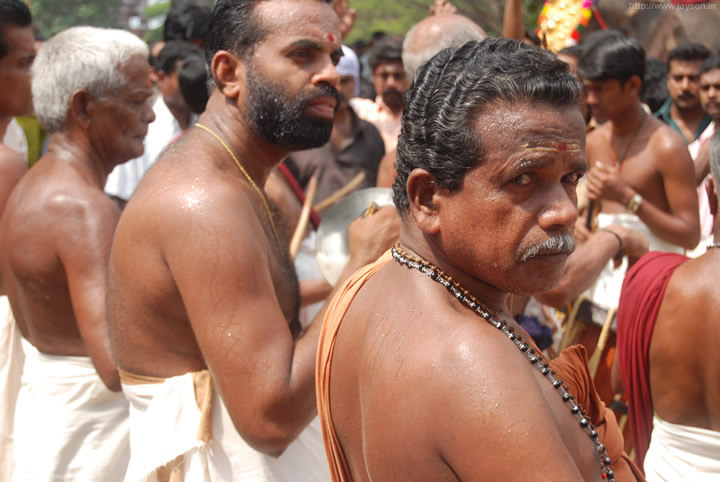 Entry to the Chamayam exhibition is free. However two guys are standing outside with "donation" coupons. 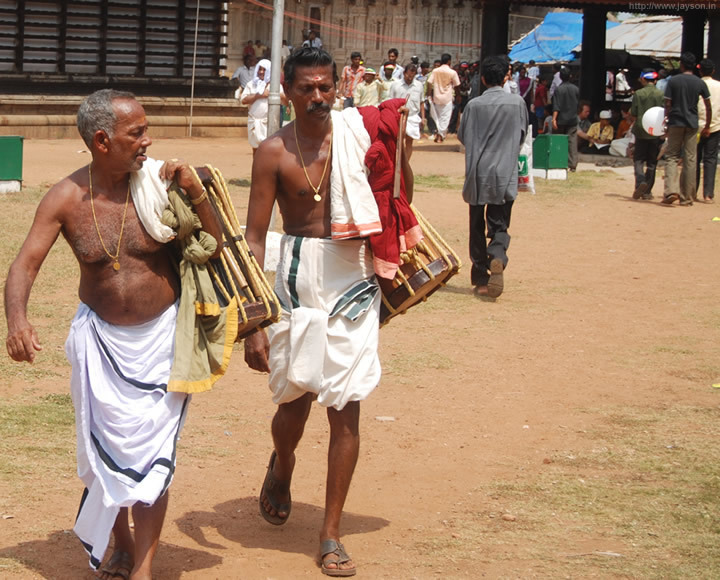 When the guy in front saw that I have a camera, he said that there is an entry fee of Rs. 25 for professional cameras. He lied to me to get "donation". I didn’t mind paying Rs. 25, but this incident again reminded me that in our country, cheating others is considered as a skill. 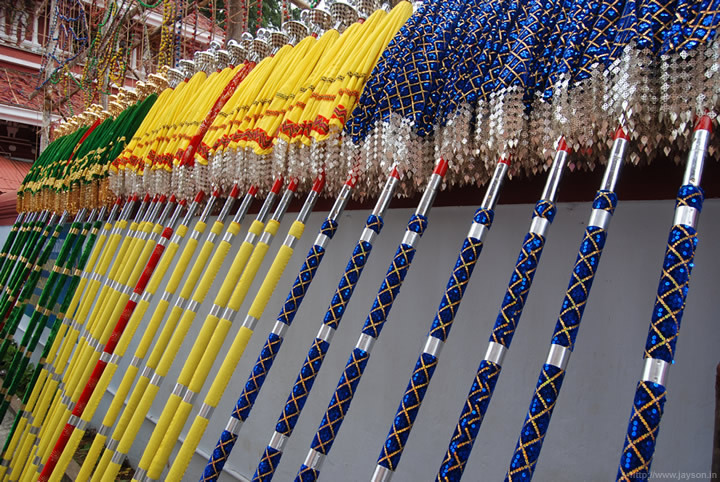 Lot of ornaments and umbrellas for the pooram are sponsored by individuals. 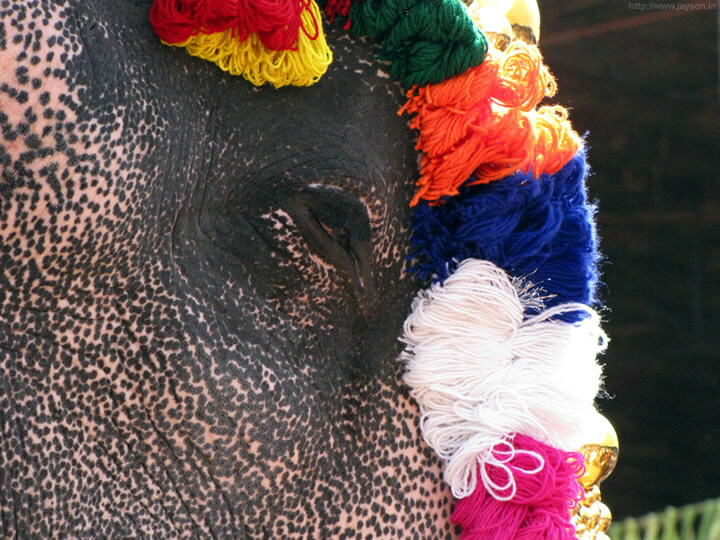 This list contains contributions from people for Thiruvambady group. 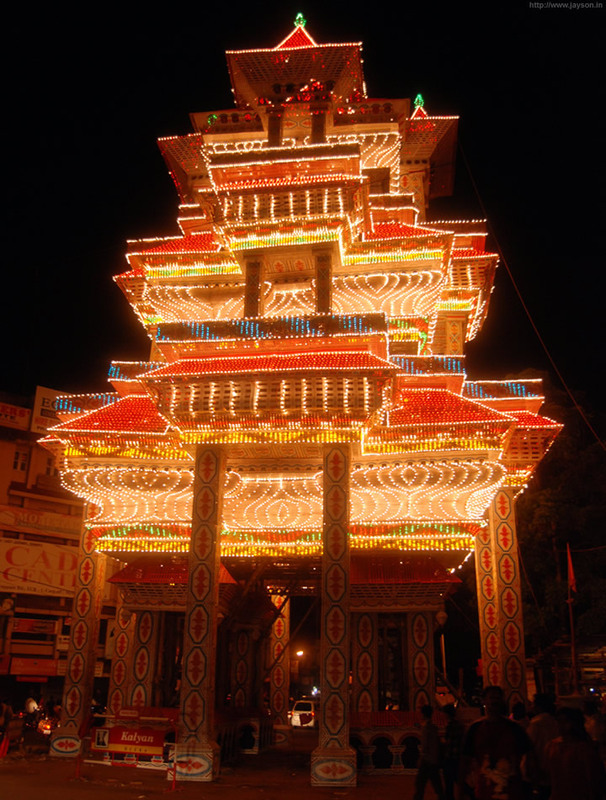 The new trend in illumination was the use of LED bulbs. 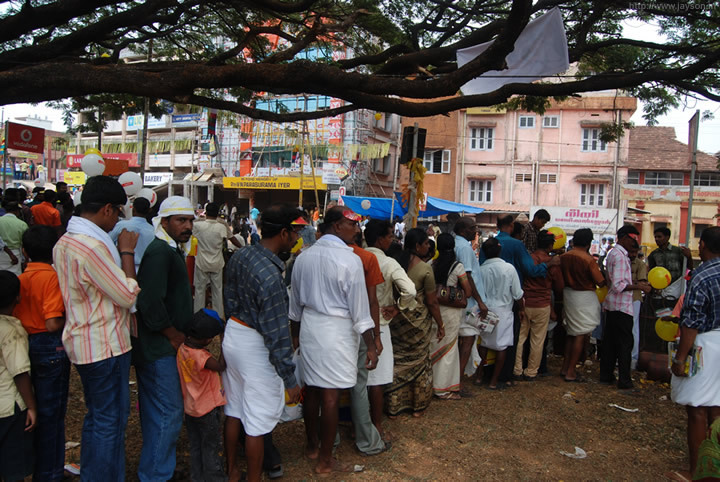 This big queue is actually for buying floating balloons (there were gas cylinders at the spot)! 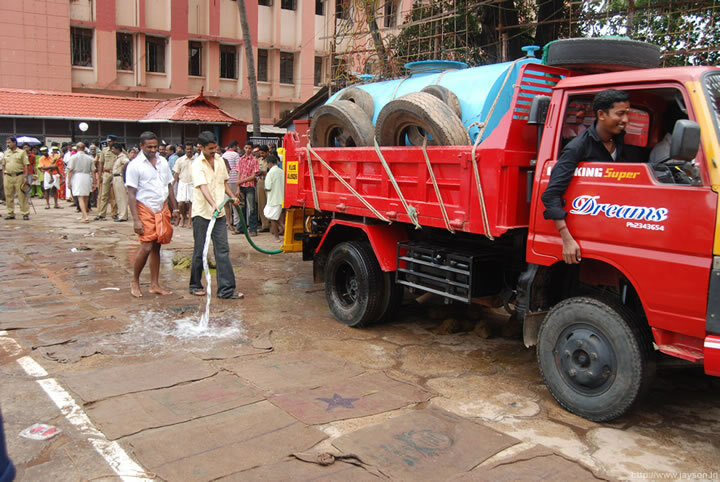 By this time, mineral water price had jumped from Rs. 15 to Rs. 20 per bottle! 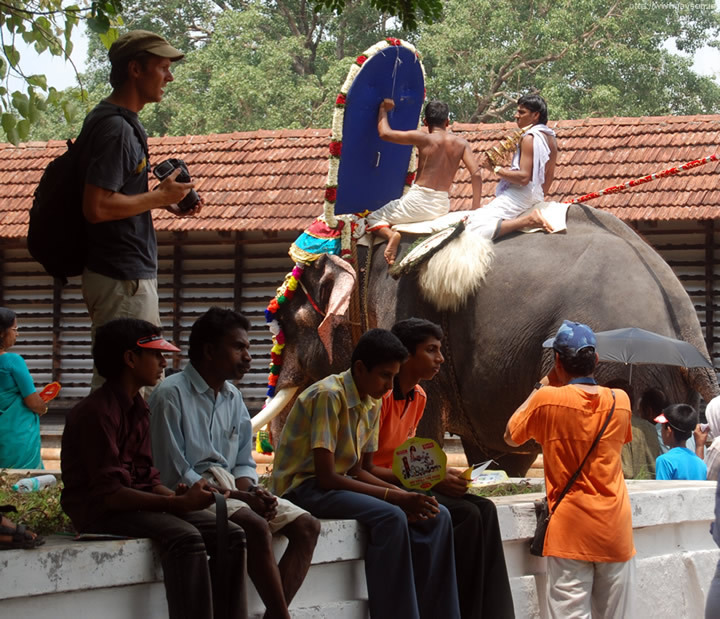 For Kudamaattam, a VIP gallery was setup for foreign tourists and local VIPs including military officers. 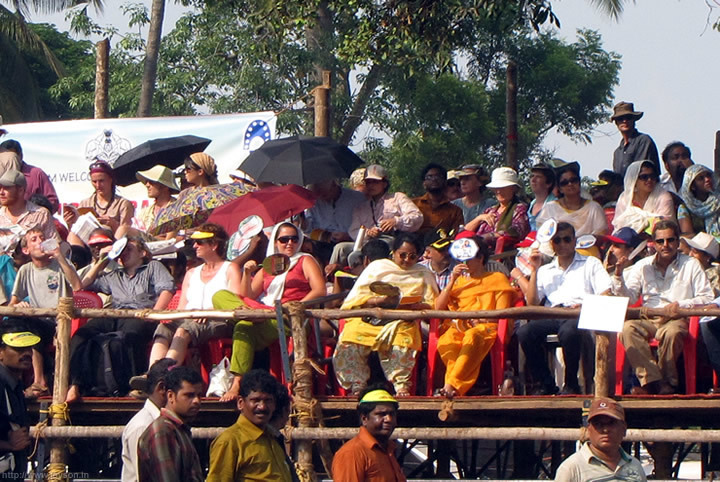 But surprisingly there was no roof for the gallery which ensured that the VIPs were also roasted in the merciless sunlight. 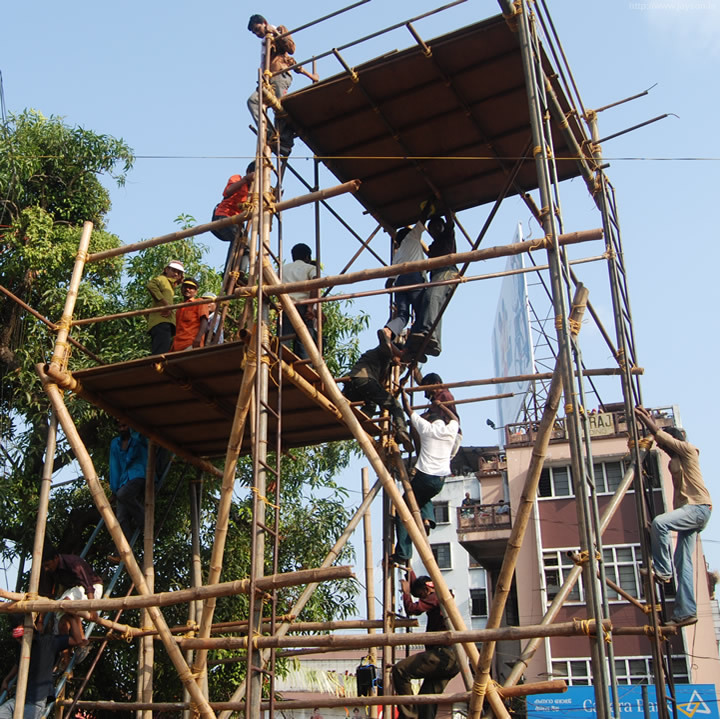 A lot of people had climbed on this to get a good view of Kudamaattam. 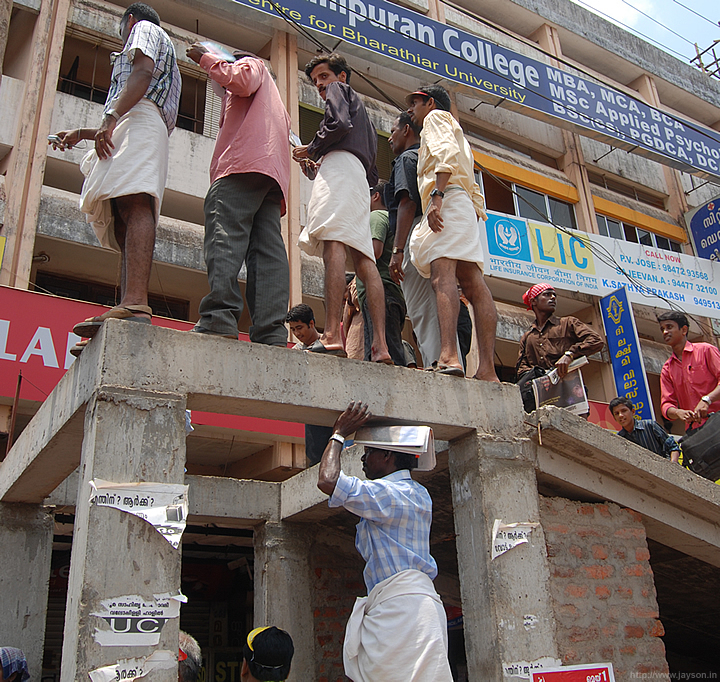 Unfortunately, police had other ideas and all of them were forced to climb down. 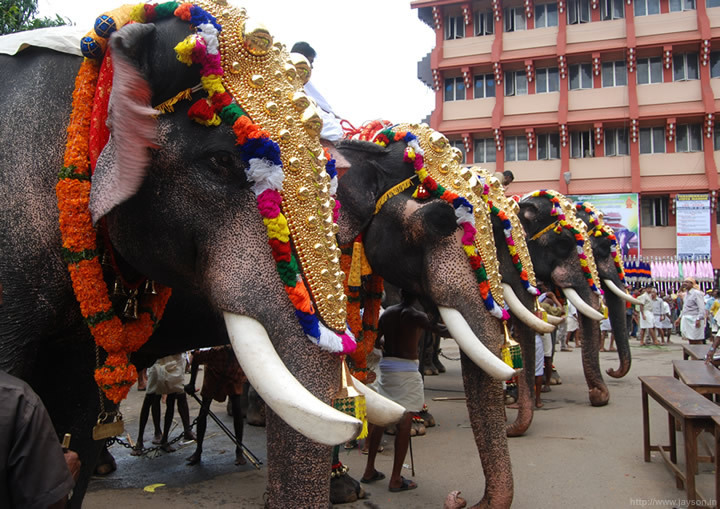 To the majority of people who come for Thrissur pooram, this is how the Kudamaattam looks like. There is a lot of dust in the air and it is suffocating. Yet, being at the spot is an exhilarating experience. However there is so much crowd here that it is never a good idea to bring your female family members at this spot. 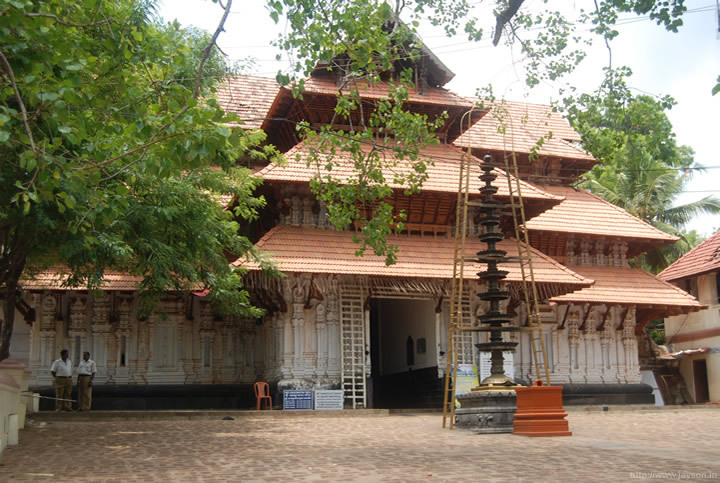 Large number of people are inside the Vadakkunnathan temple and hence the entry into the temple was restricted by police. Yet, some people desperately want to get inside . For what? I have no clue! 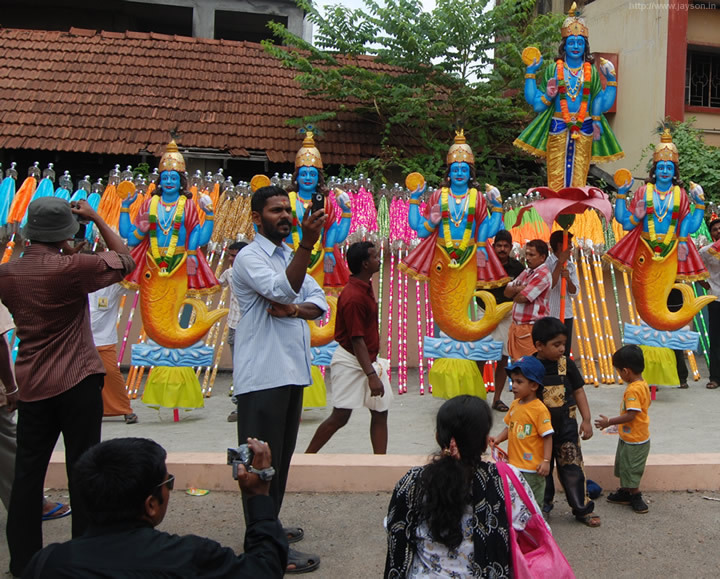 The Kudamaattam has reached its final stage and then I realized that I am right in the middle of a huge bachelor party! 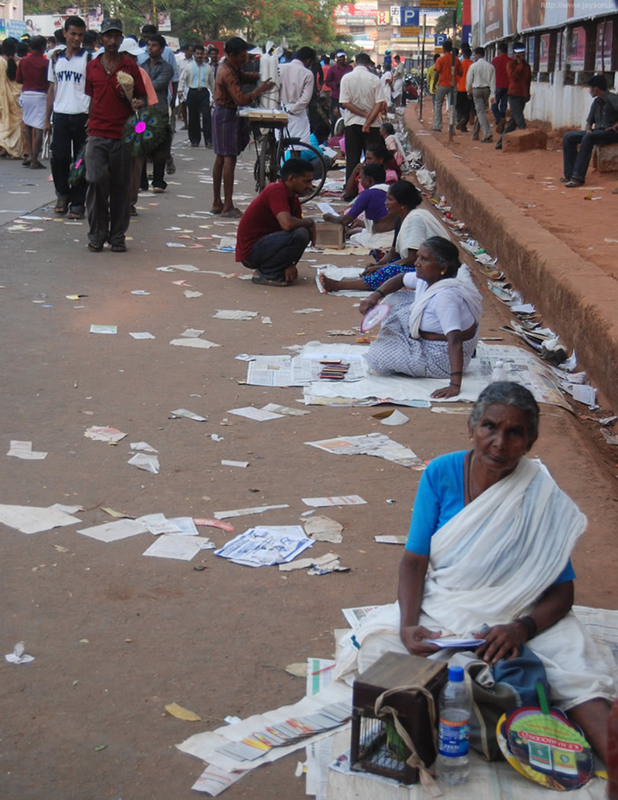 While Kudamaattam was going on near Paramekkavu temple, a large group of fortune tellers (most of them women) had gathered at the other side of the road. 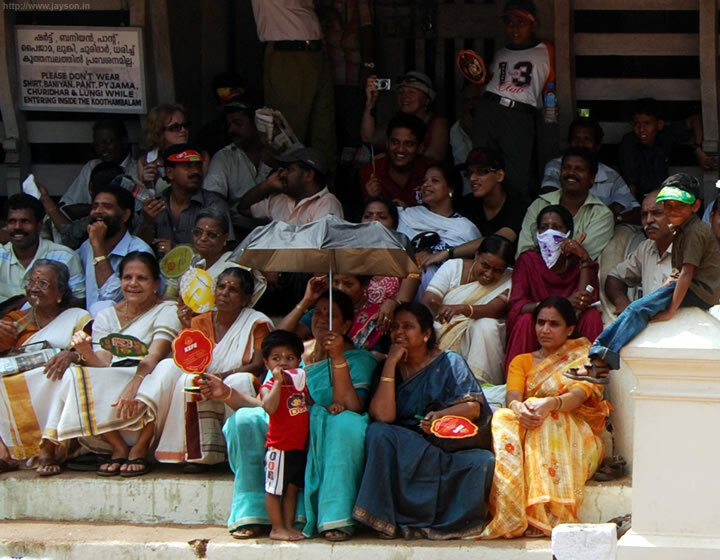 It looks as if all the fortune tellers in Kerala had assembled at Thrissur! Really astonishing work by you….!! 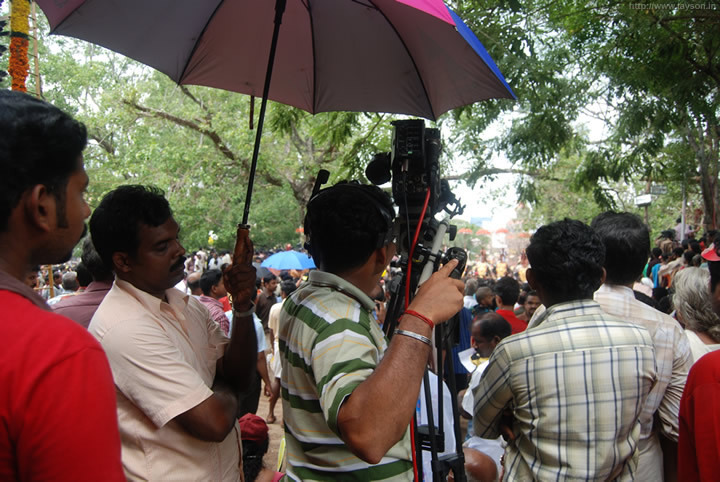 Even being in Thrissur for 4 years & in the thick of Pooram affairs (as Asianet-ACV was the first Local TV channel to telecast Pooram Live… it started wayback in 1996), never went into the depth as u did…! Very detailed and informative work Jayson !! 🙂 Also liked the facebook updates inbtween – This one is polished and the photo journal is arranged in proper sequence ! !